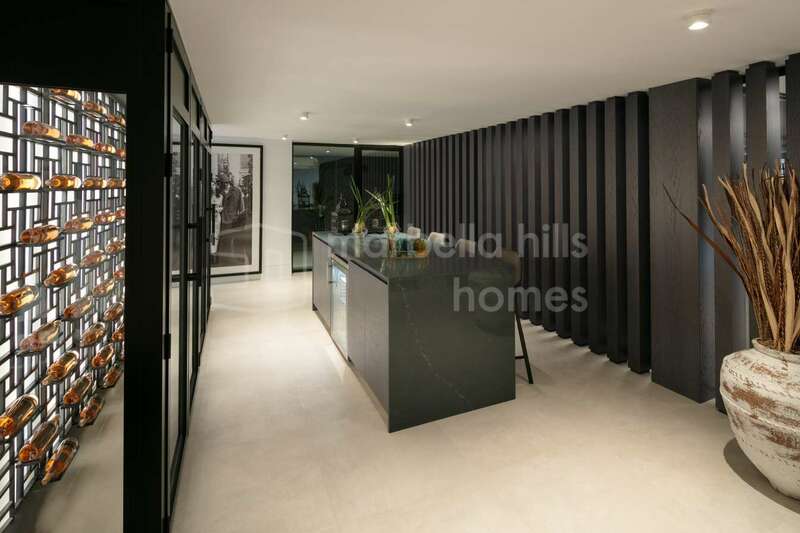 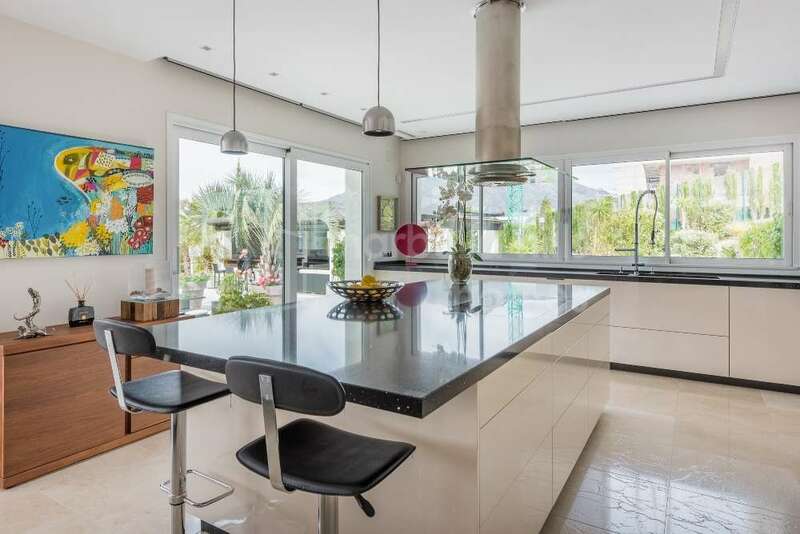 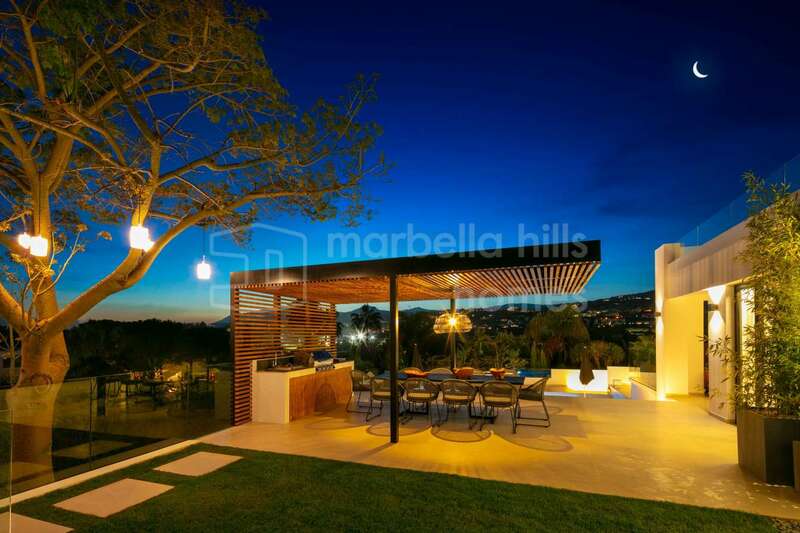 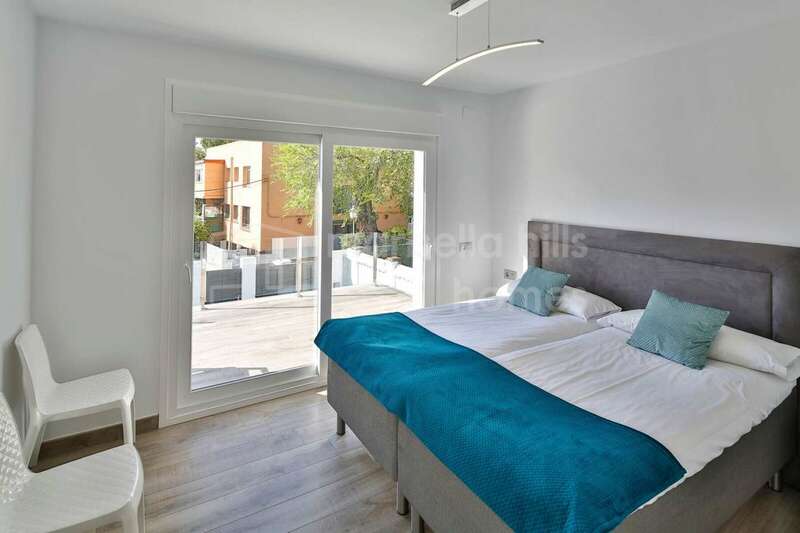 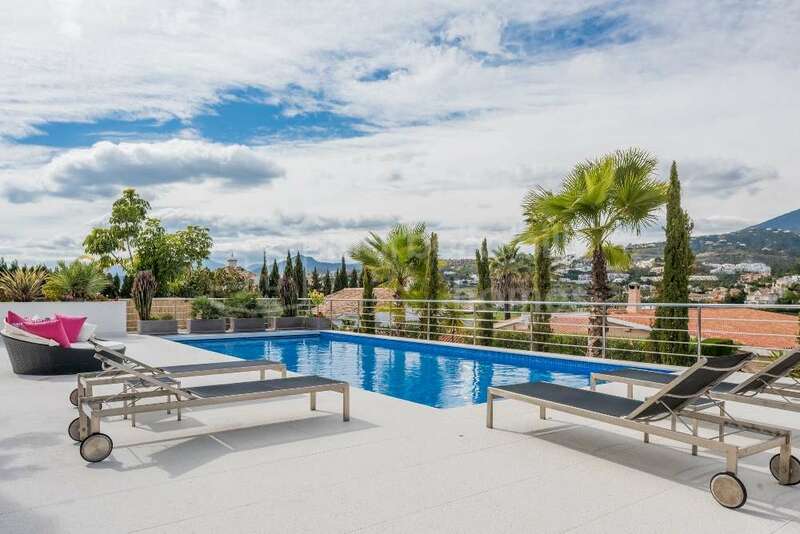 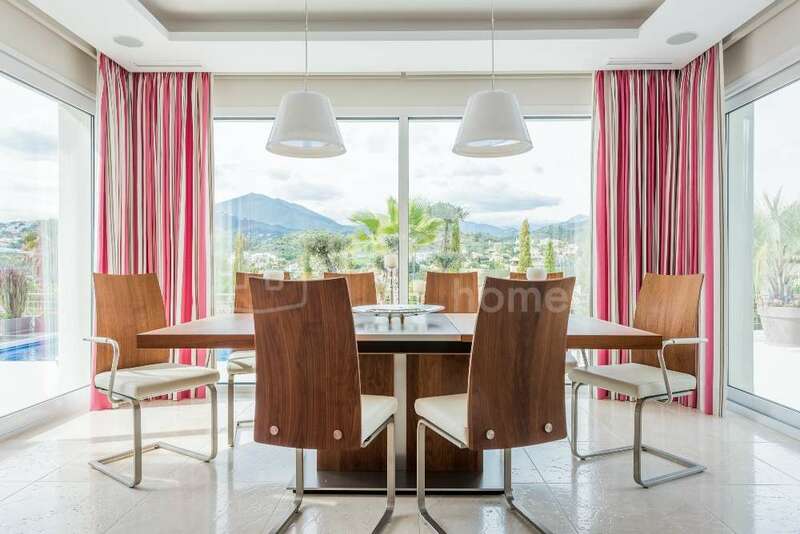 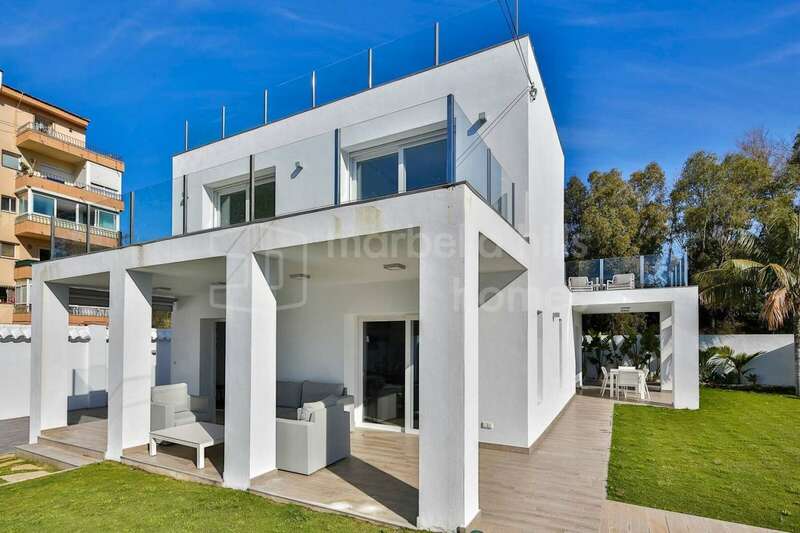 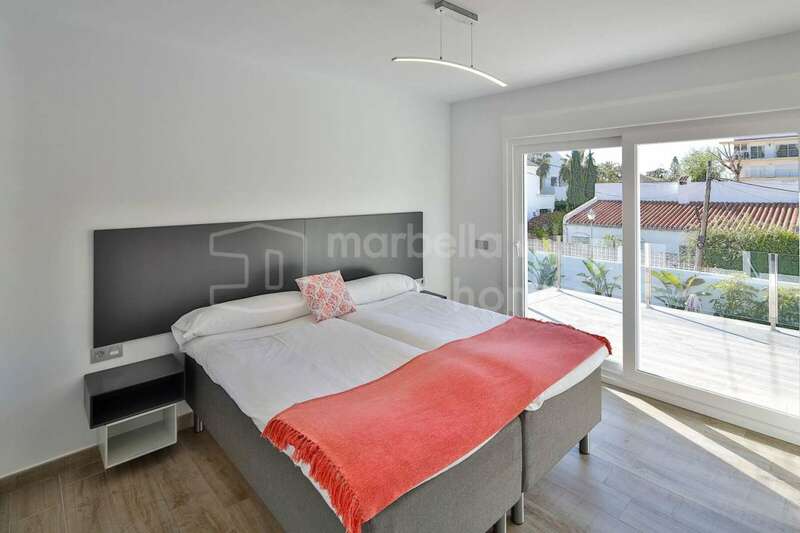 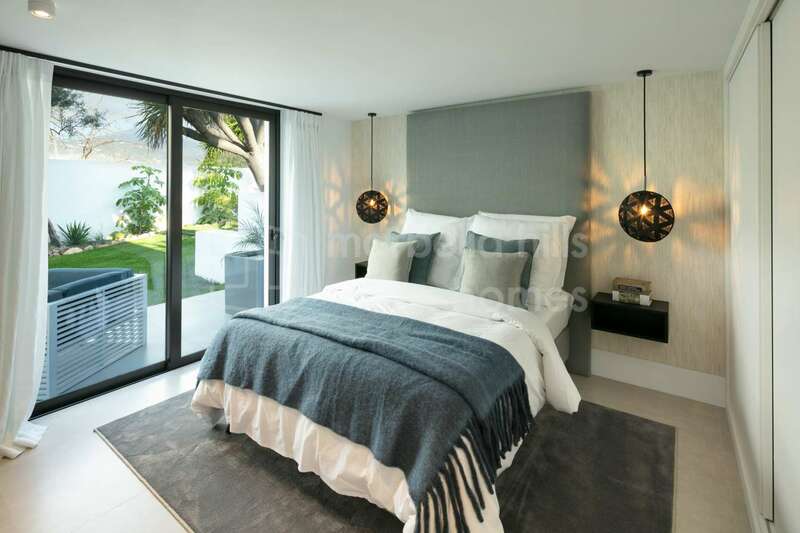 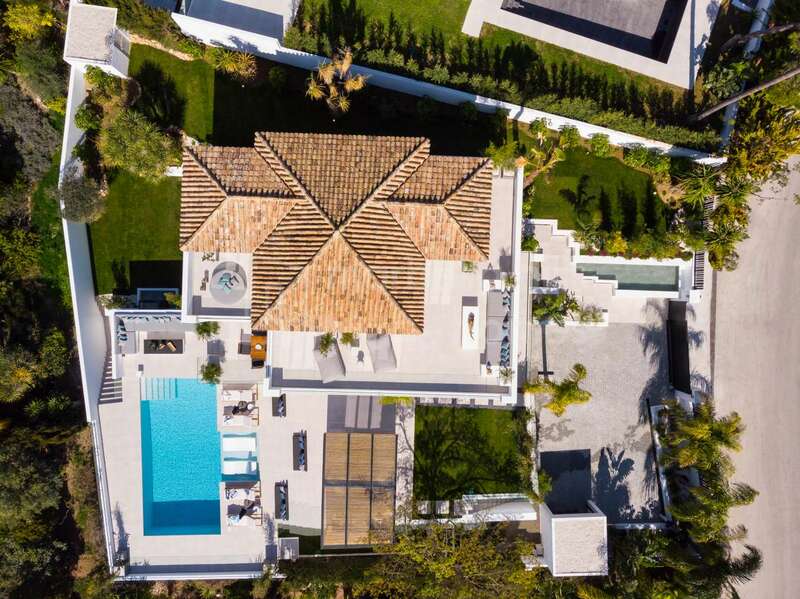 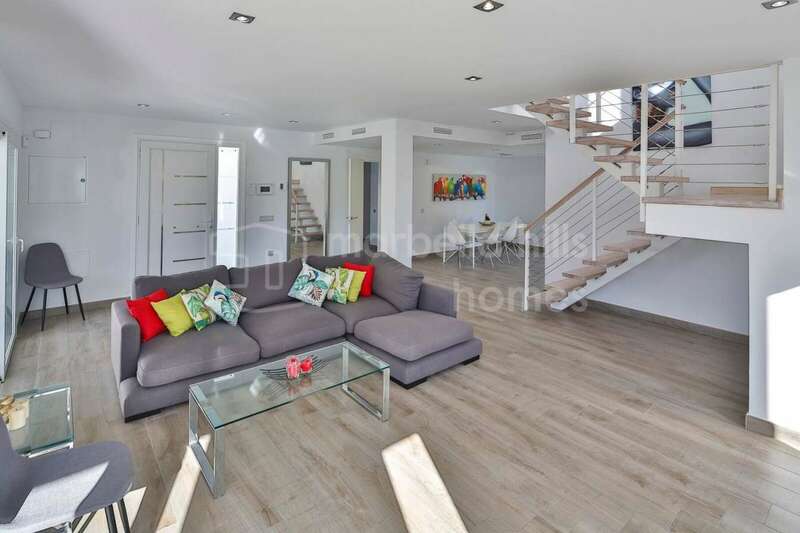 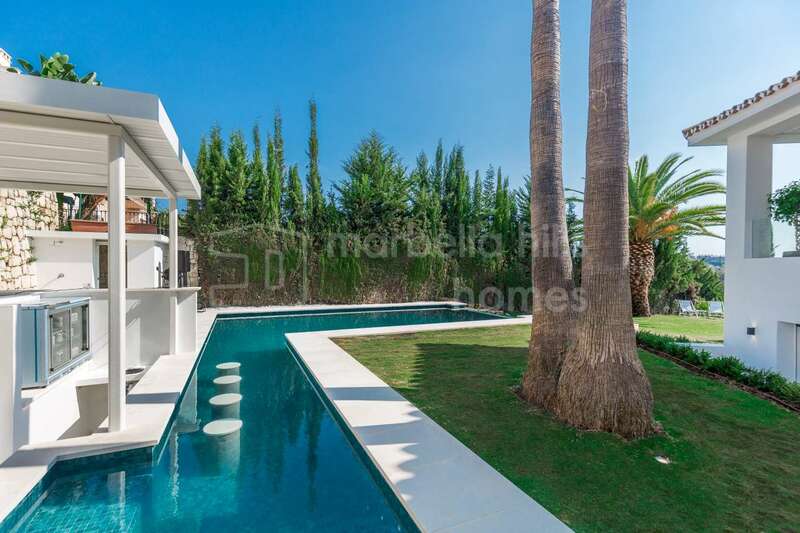 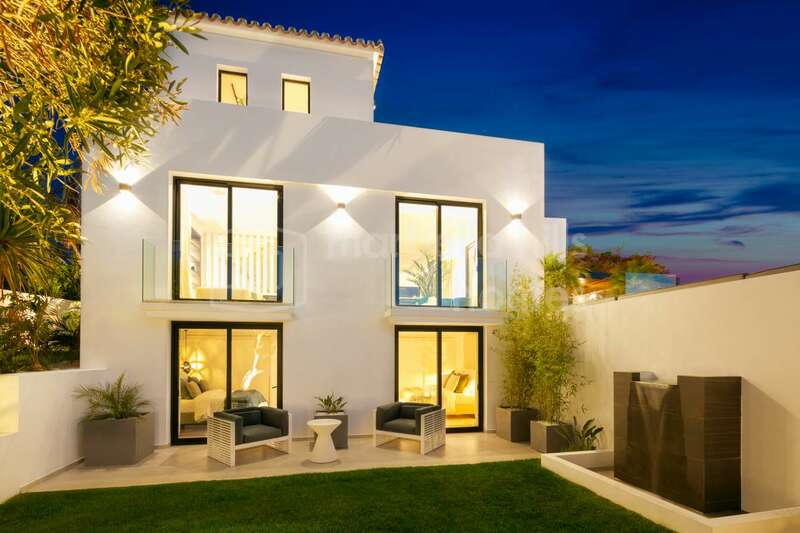 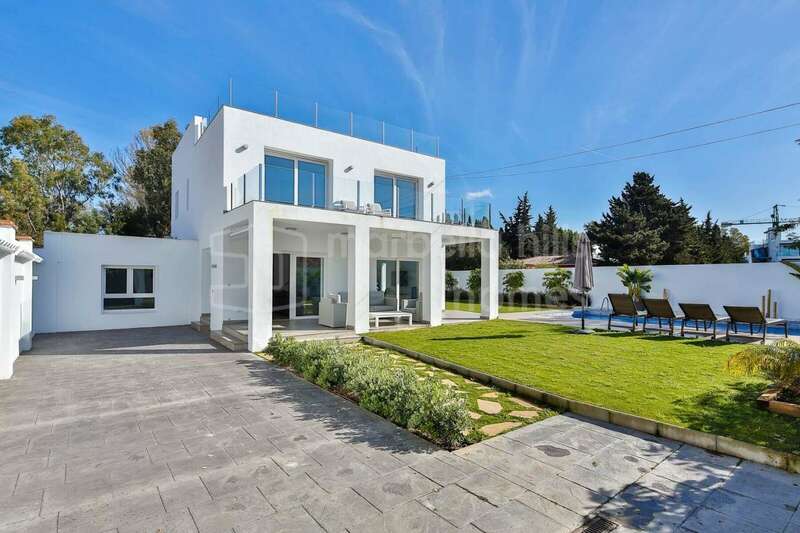 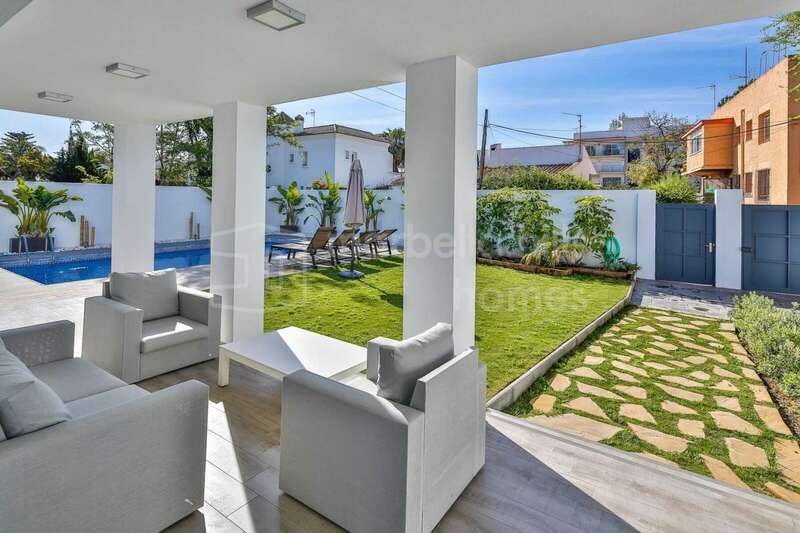 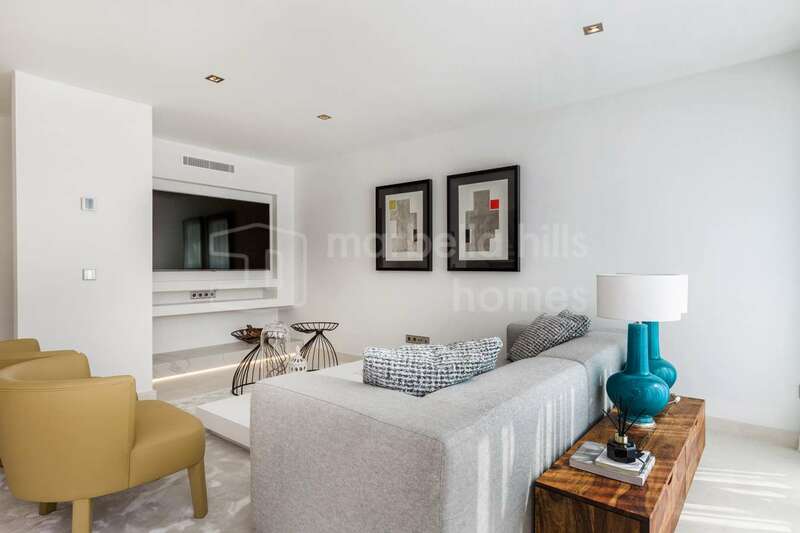 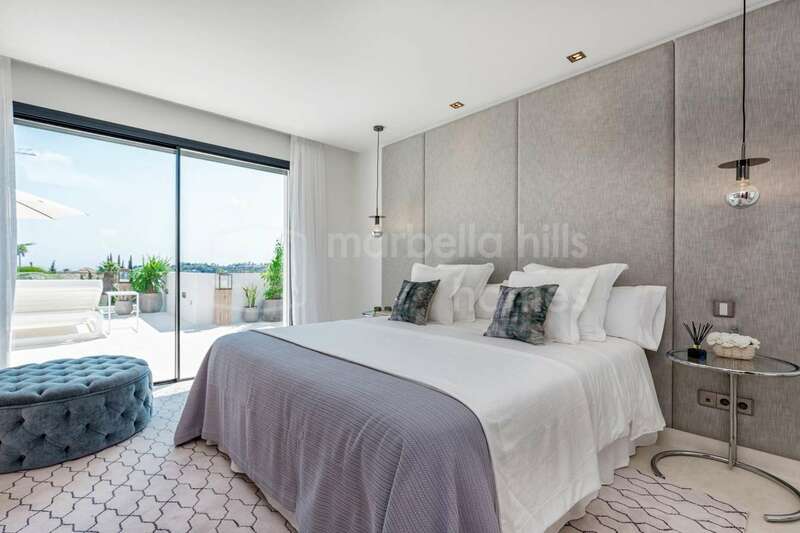 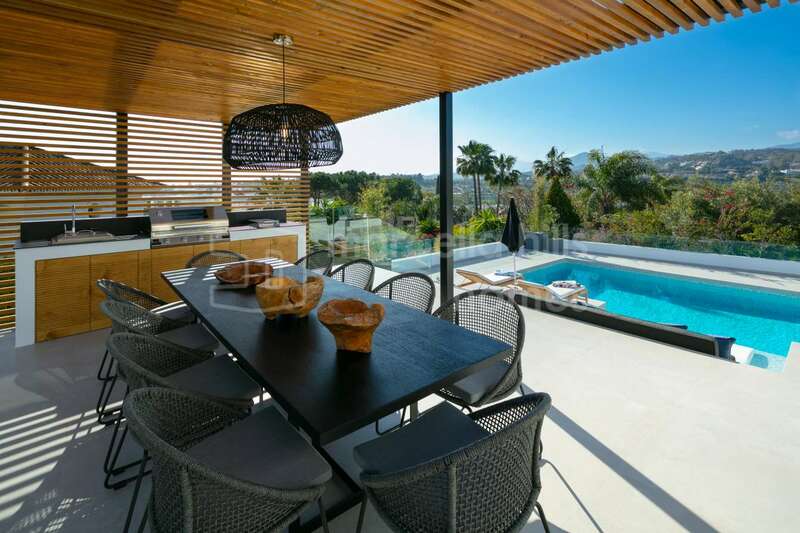 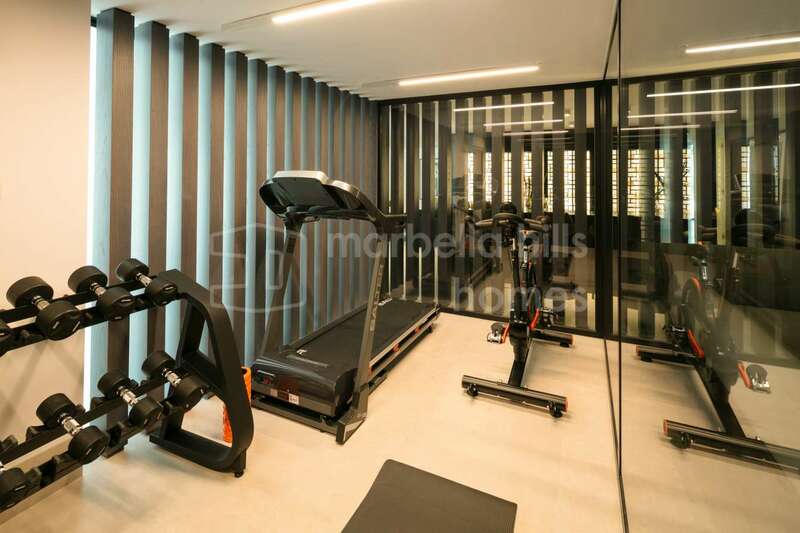 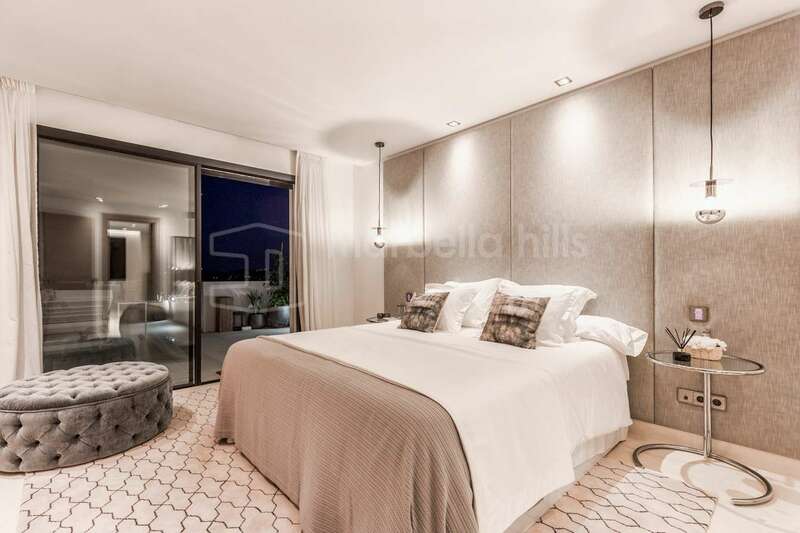 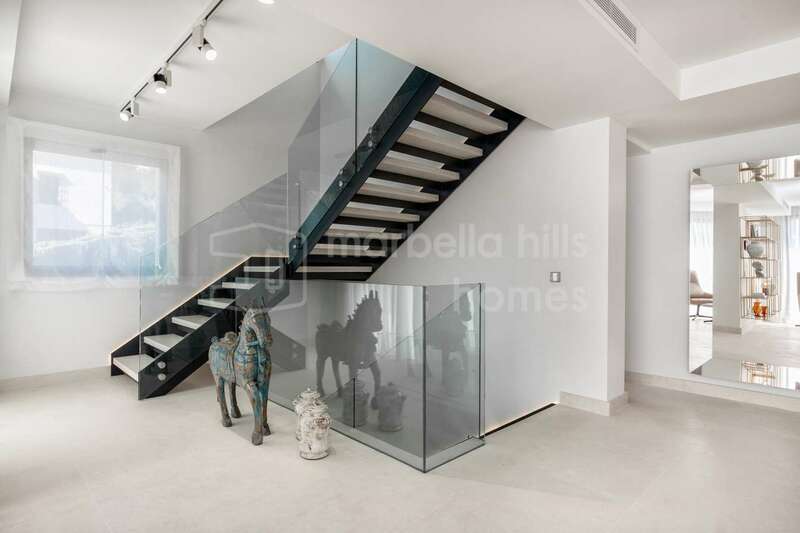 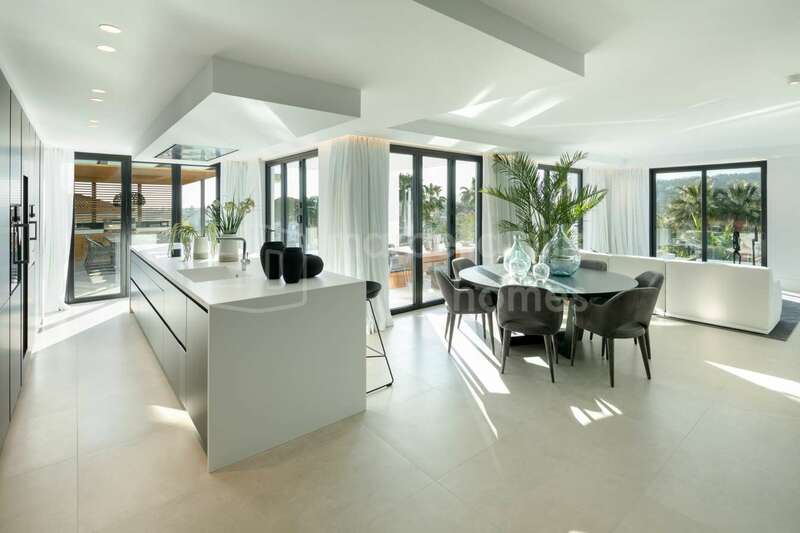 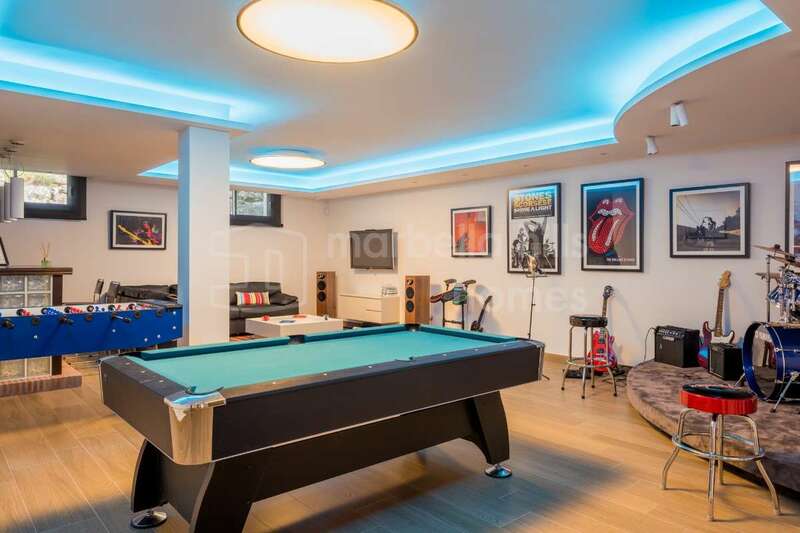 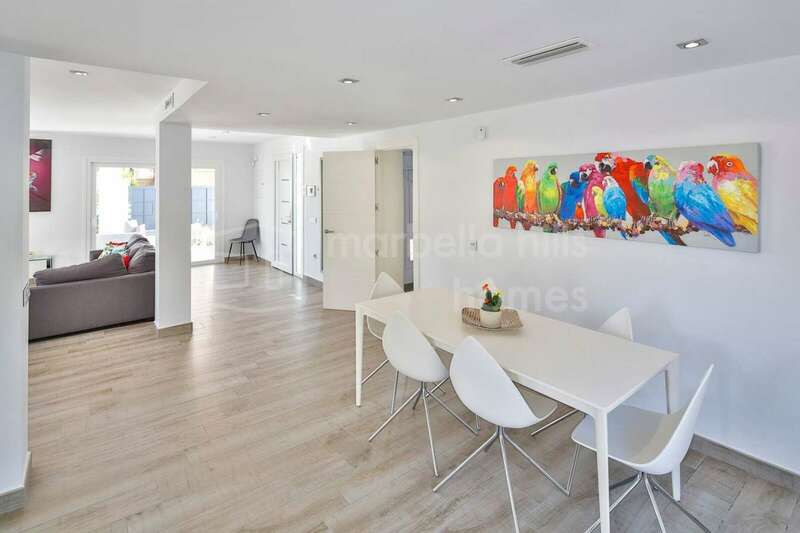 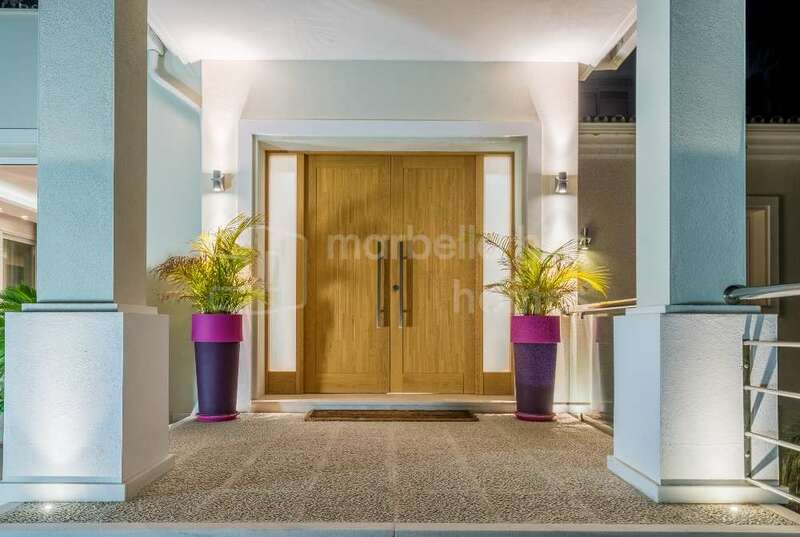 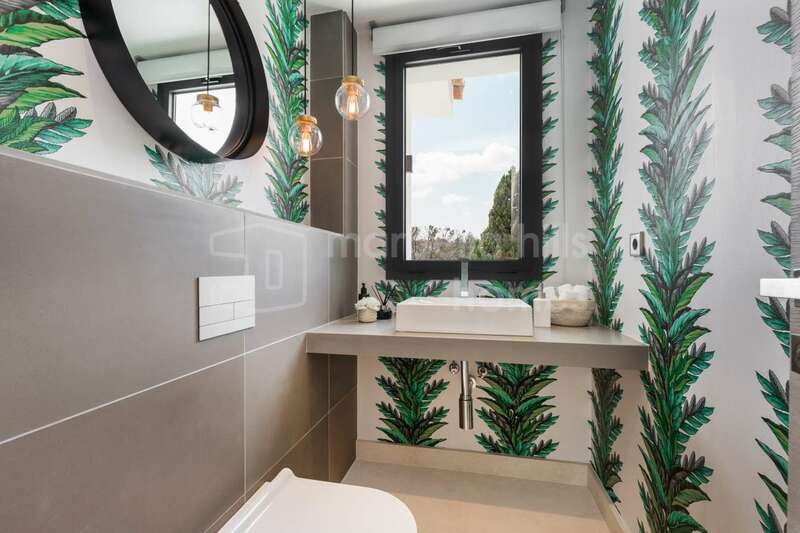 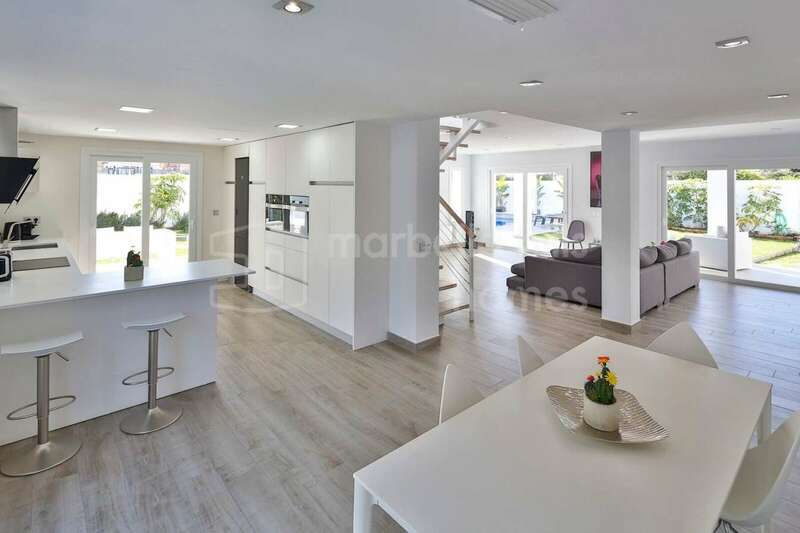 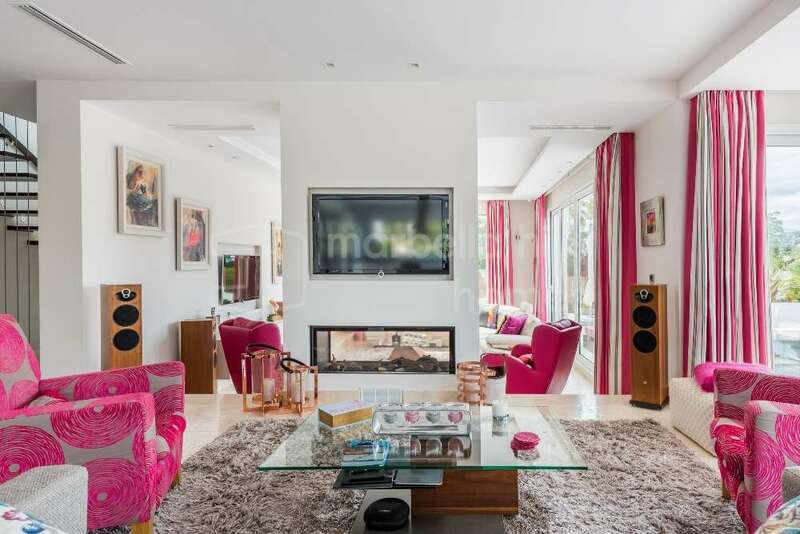 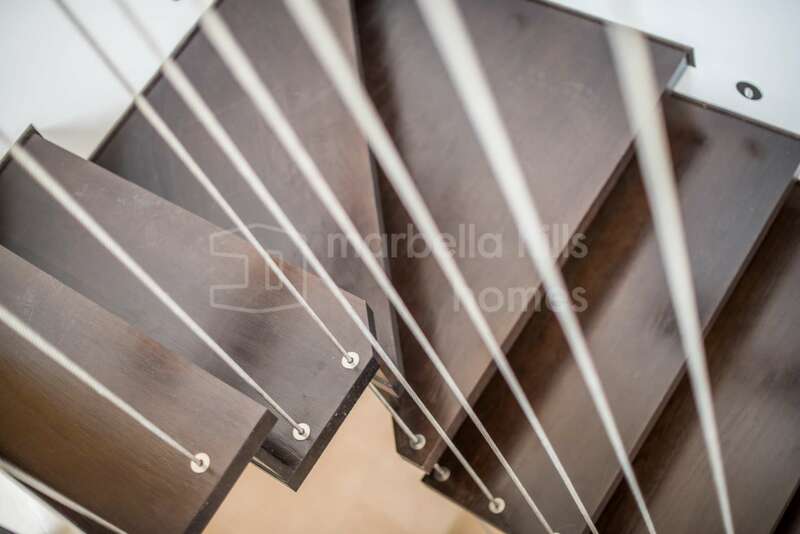 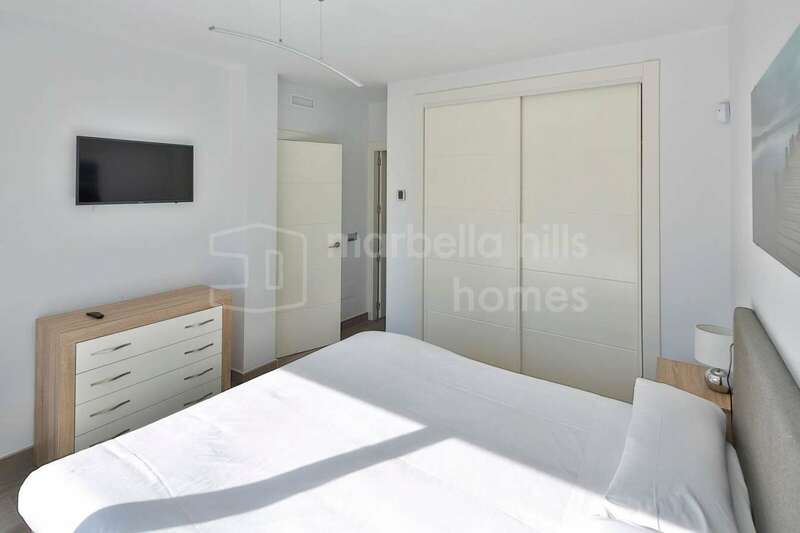 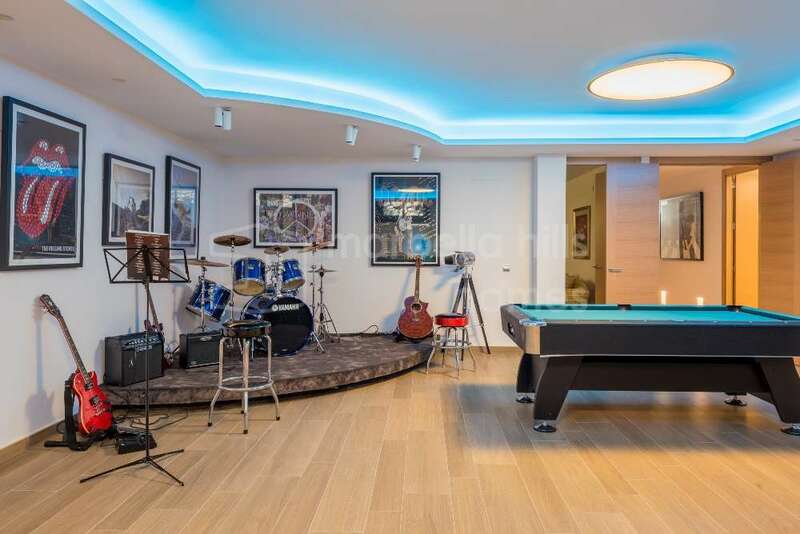 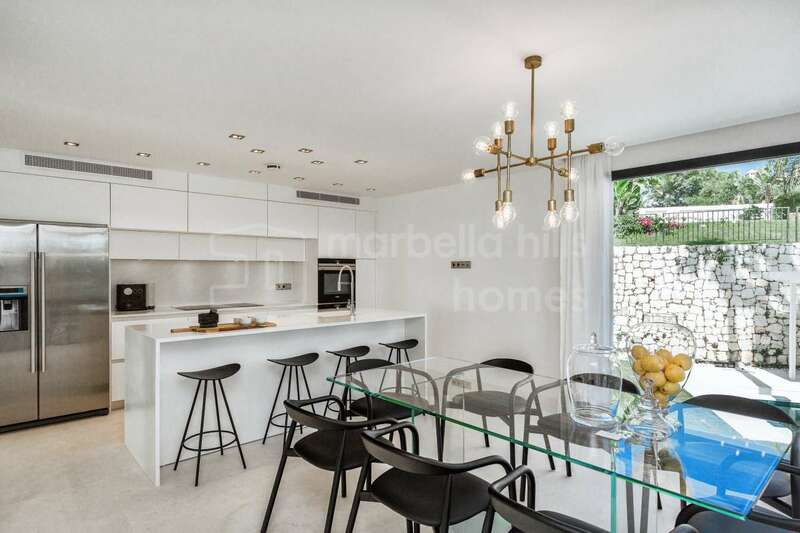 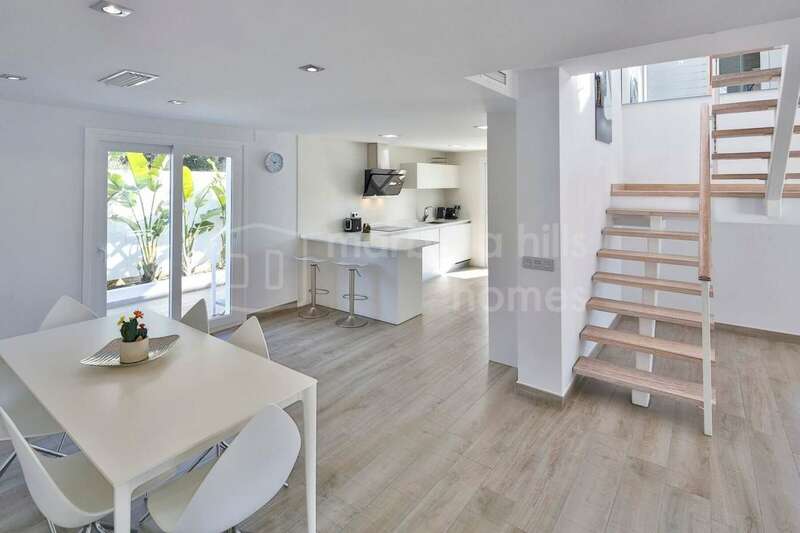 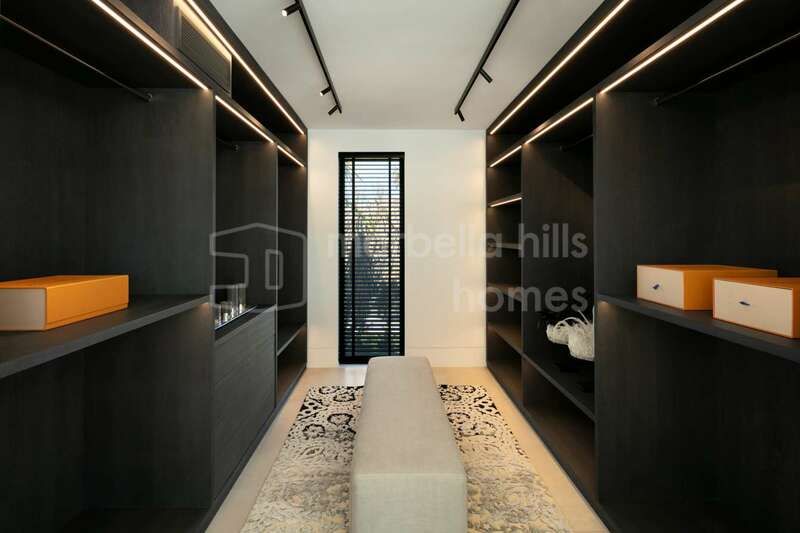 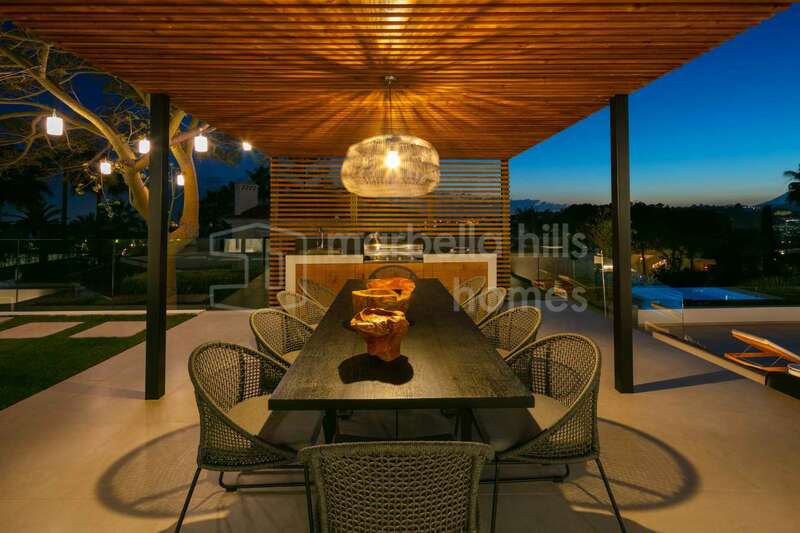 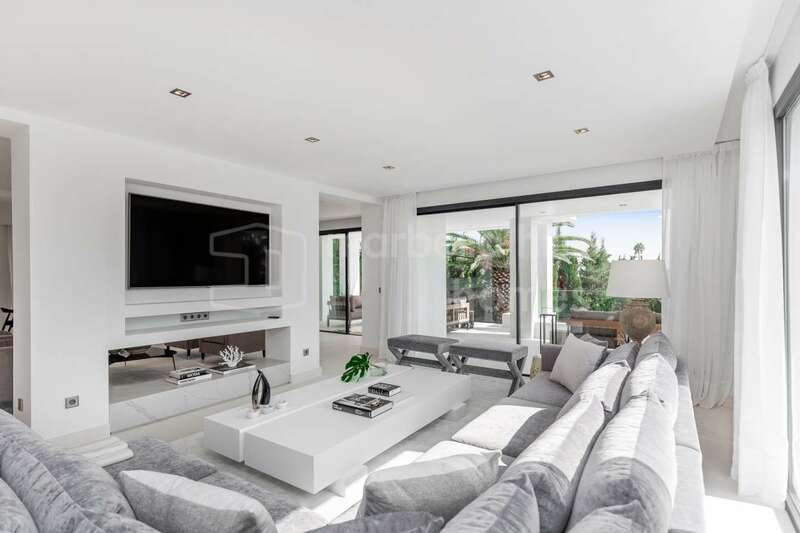 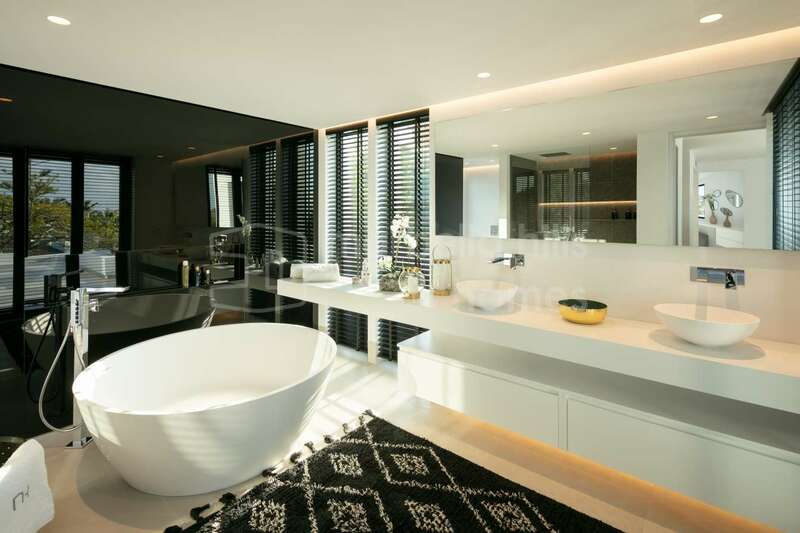 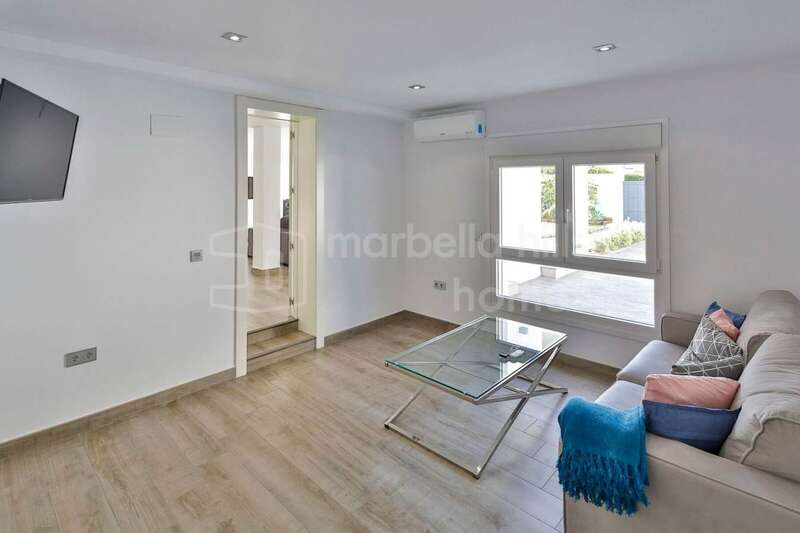 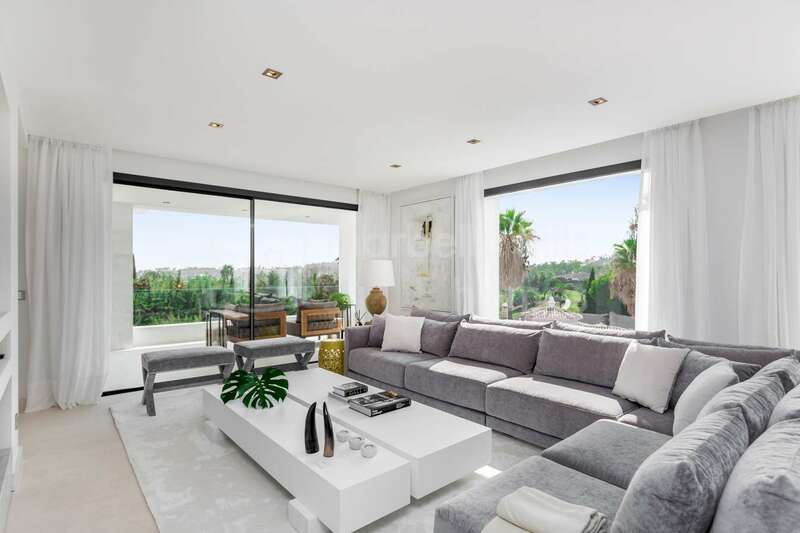 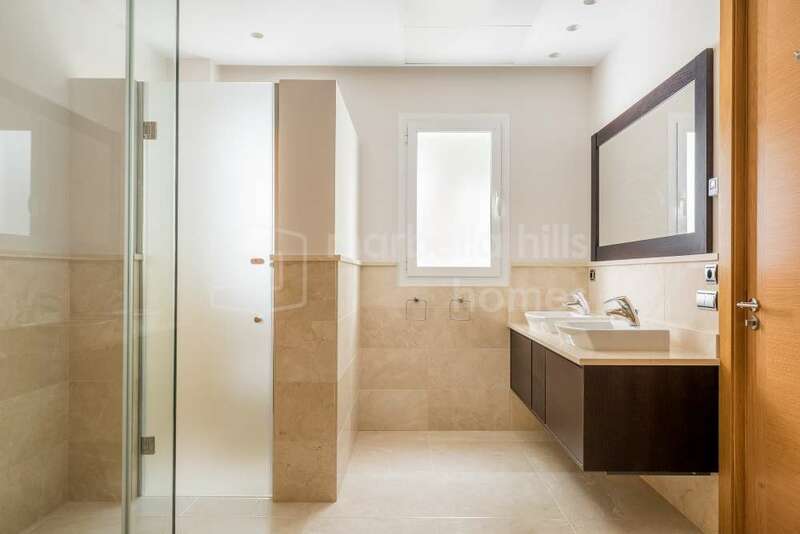 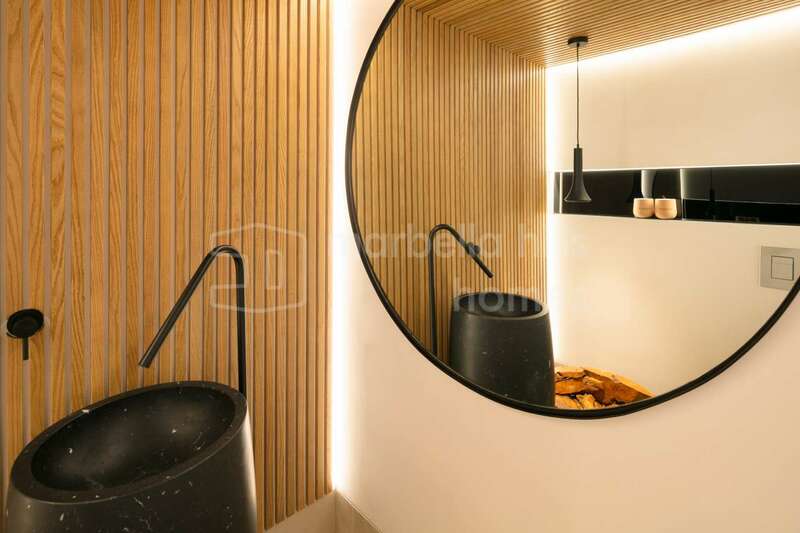 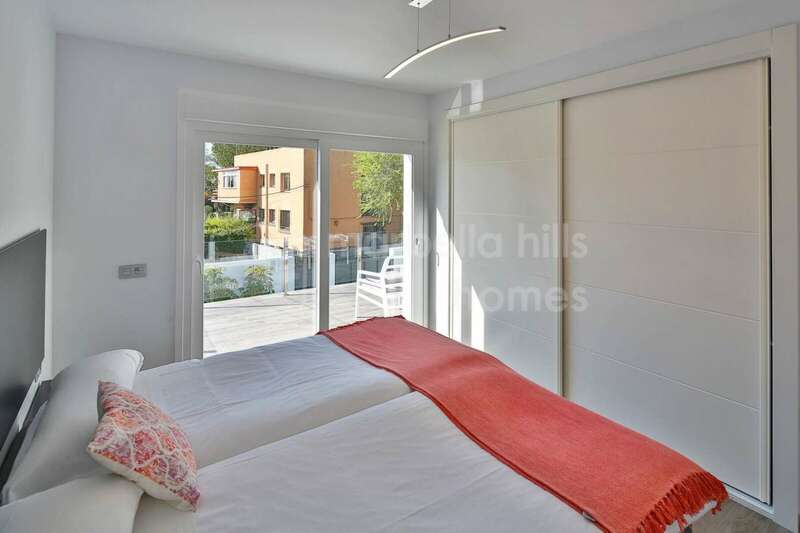 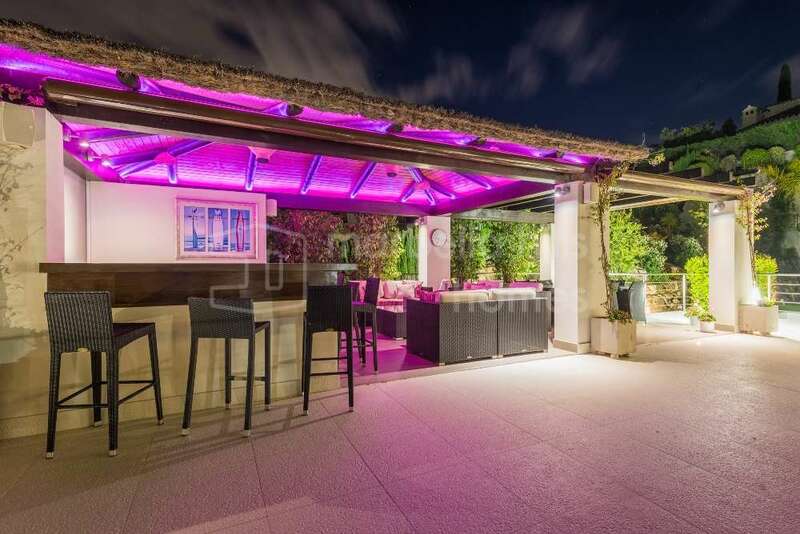 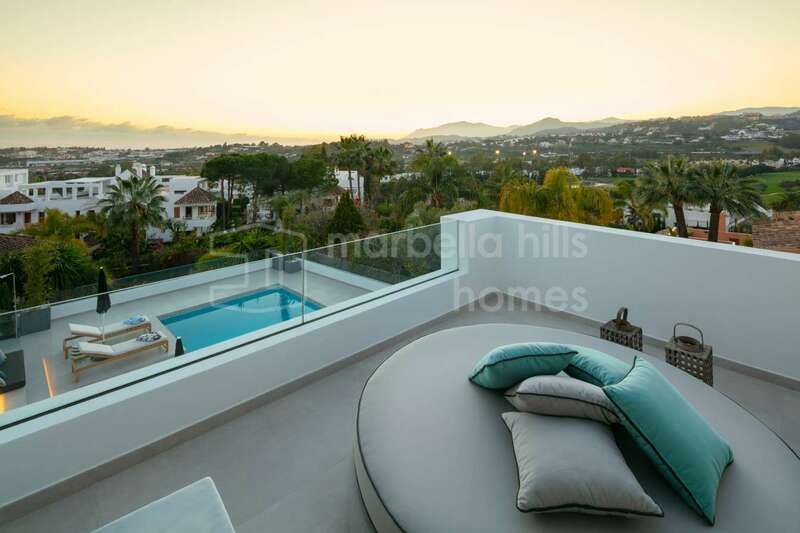 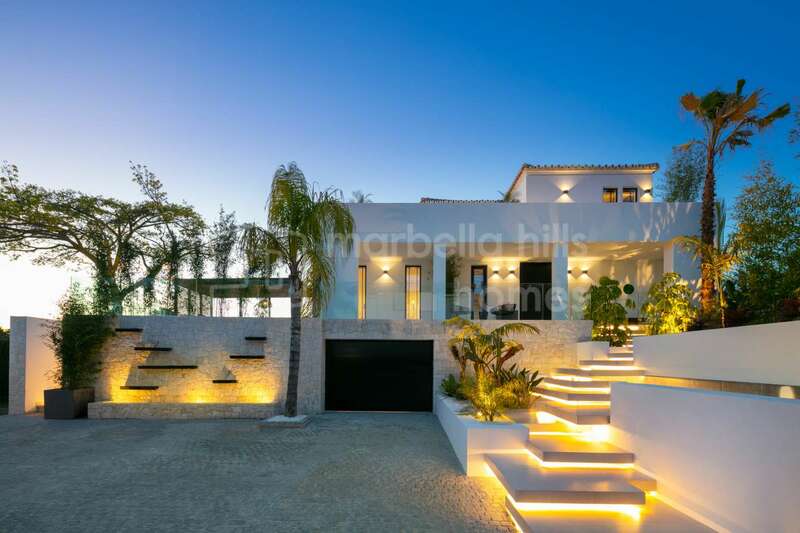 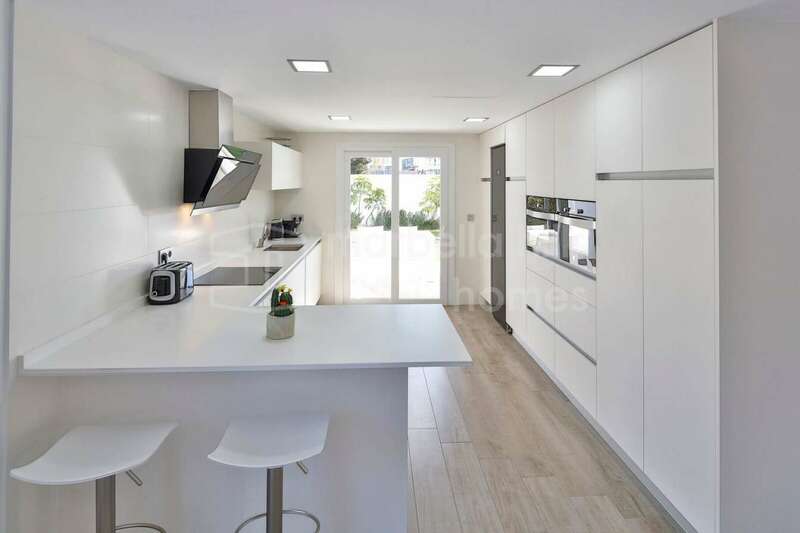 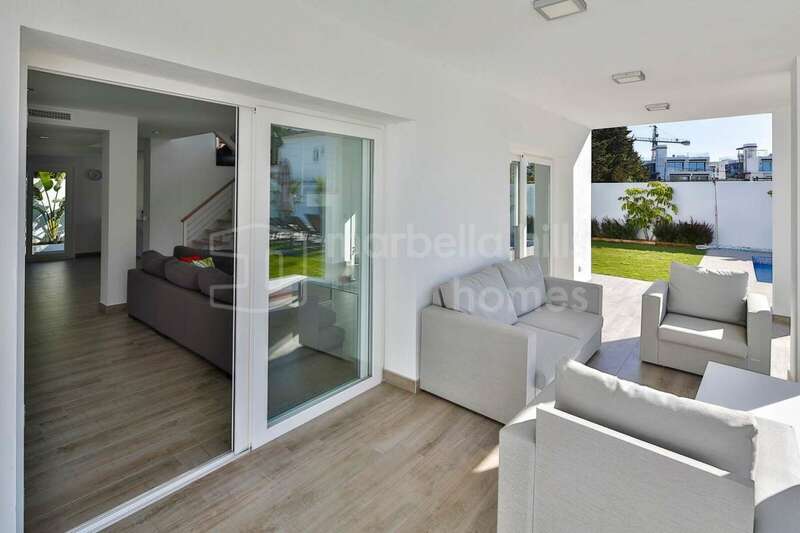 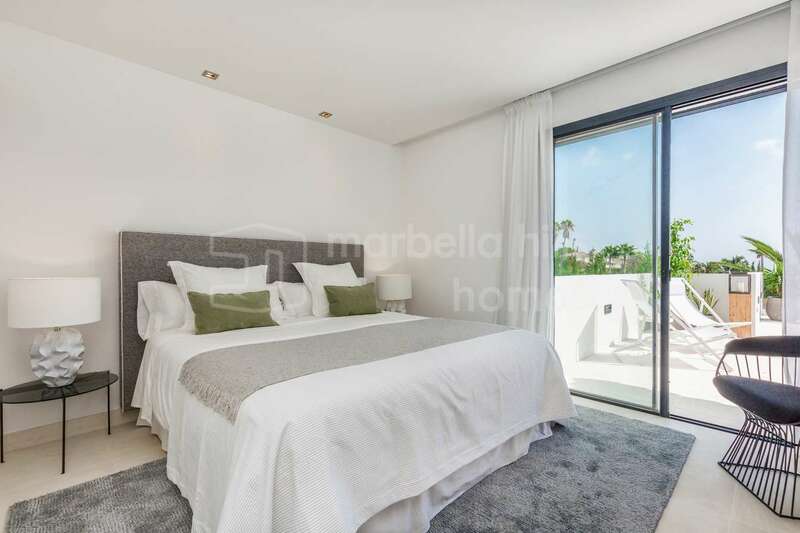 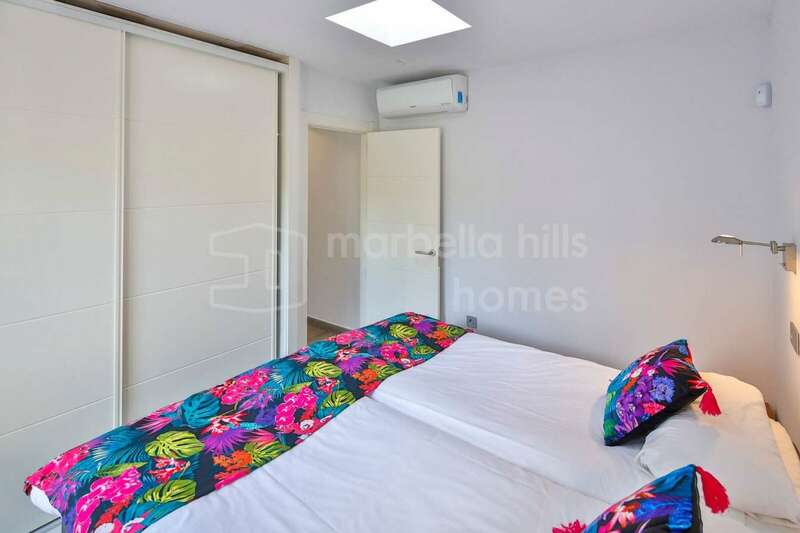 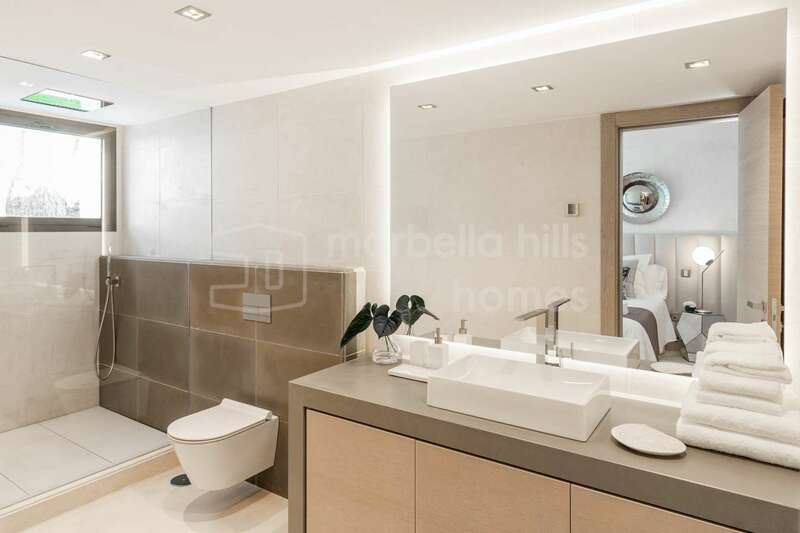 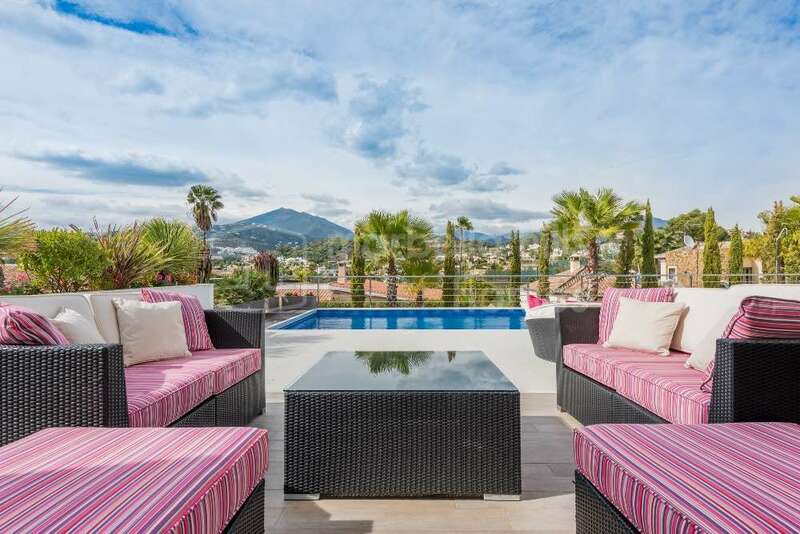 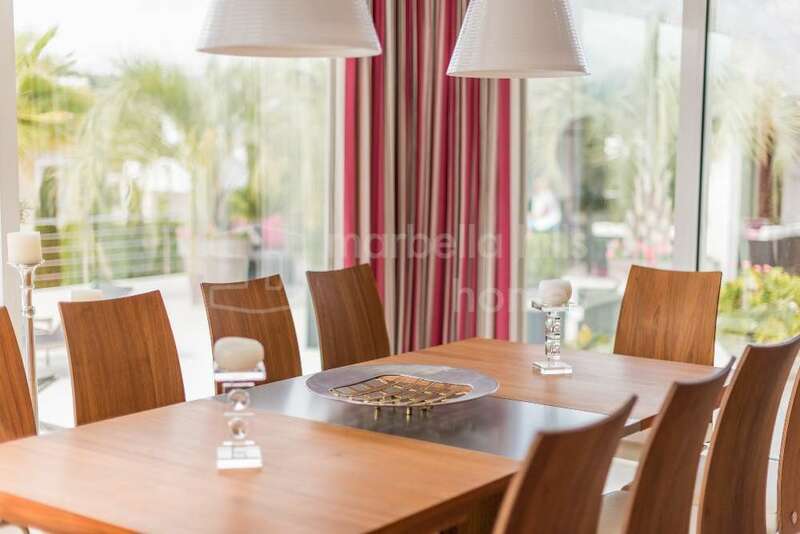 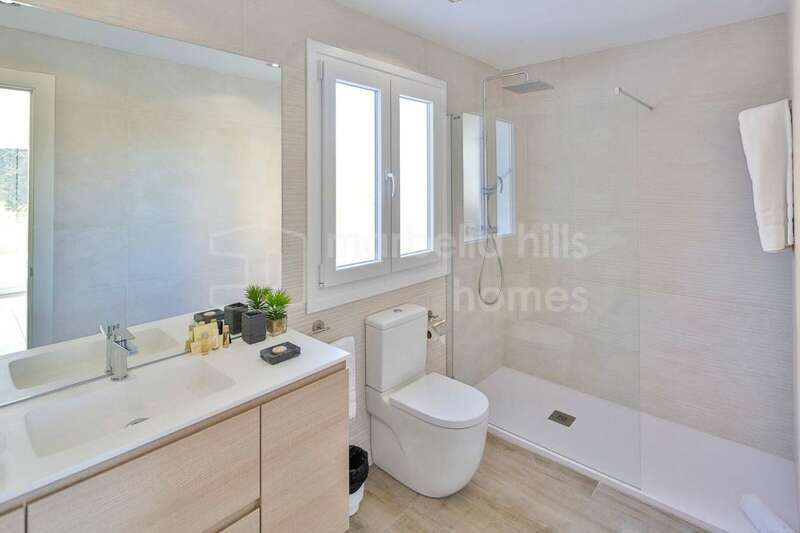 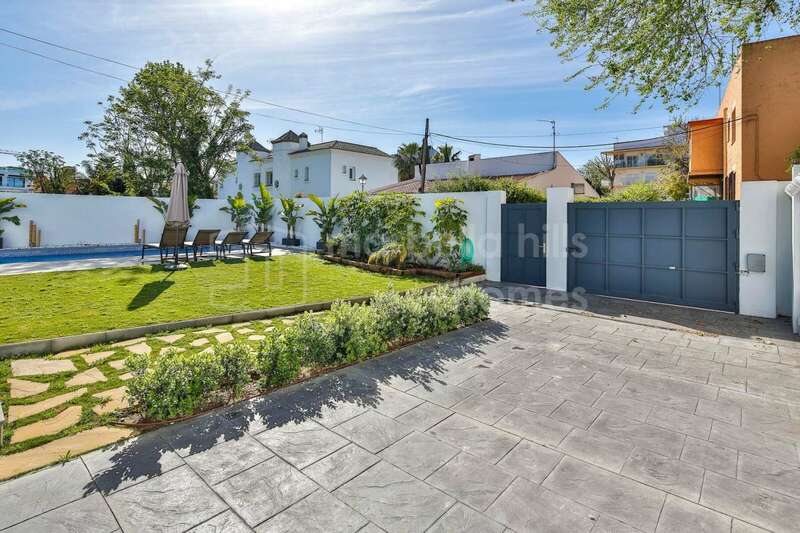 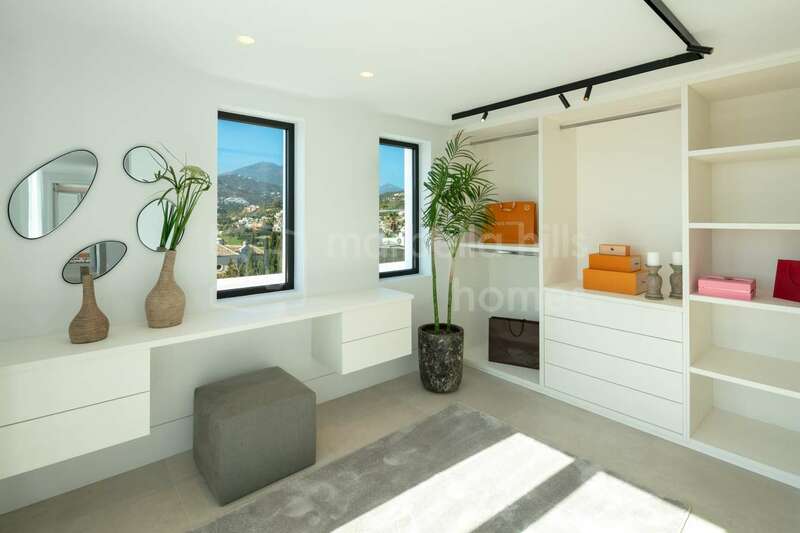 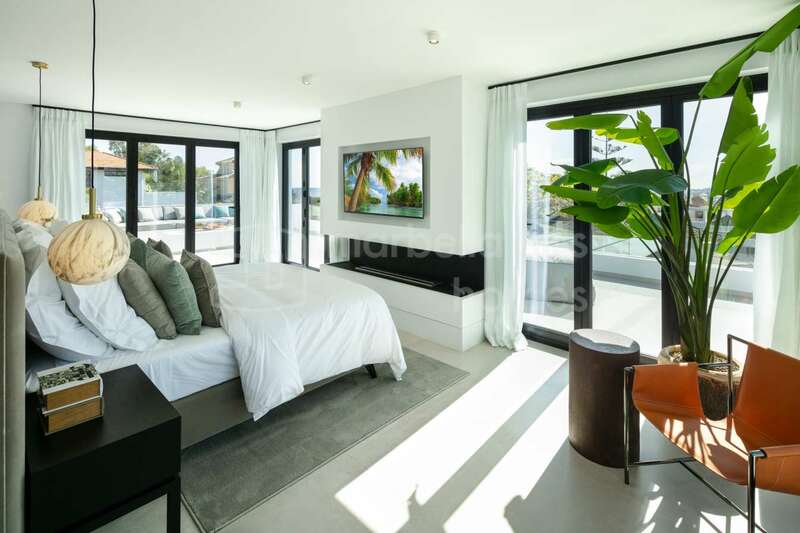 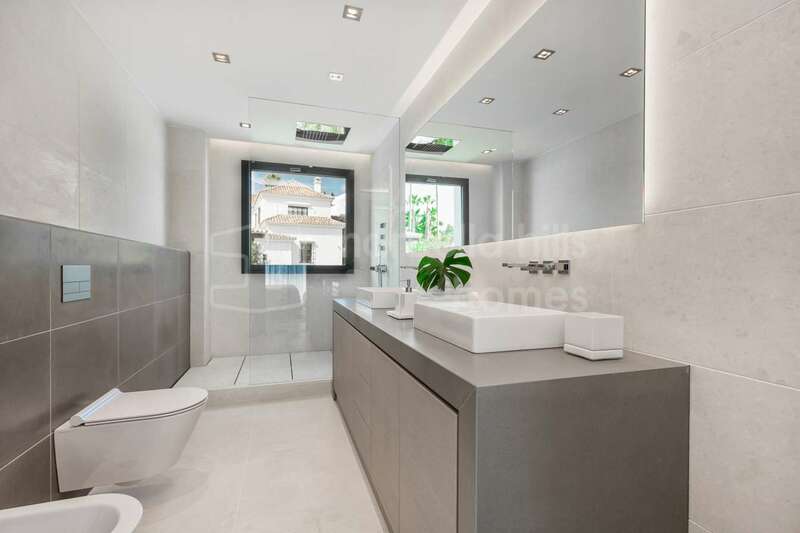 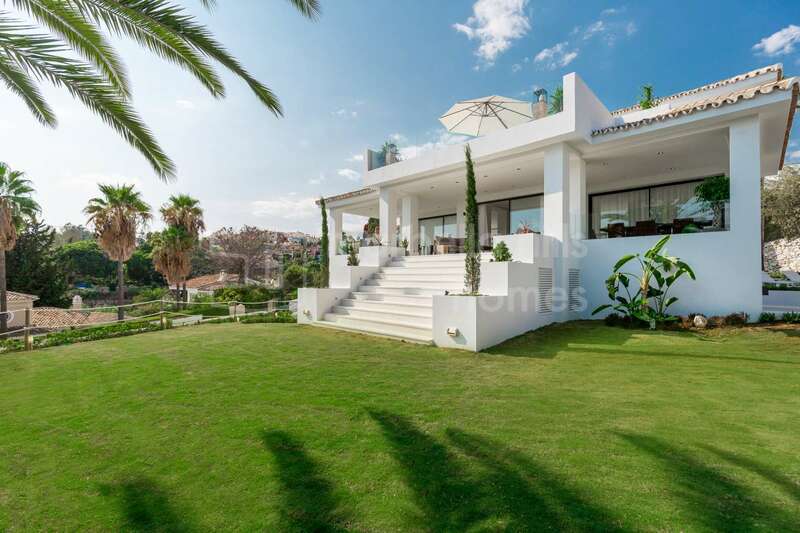 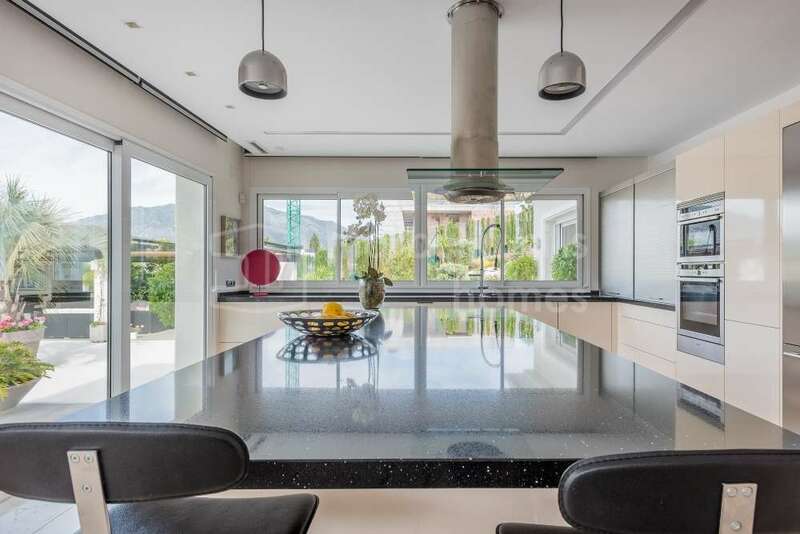 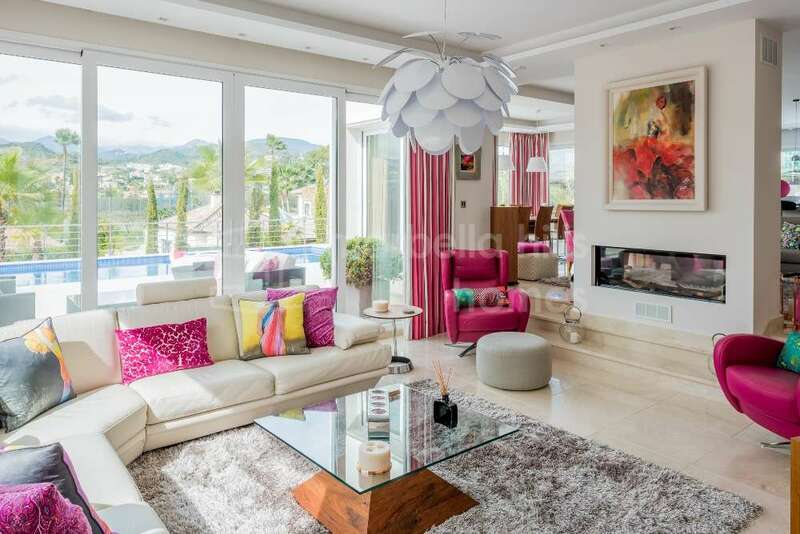 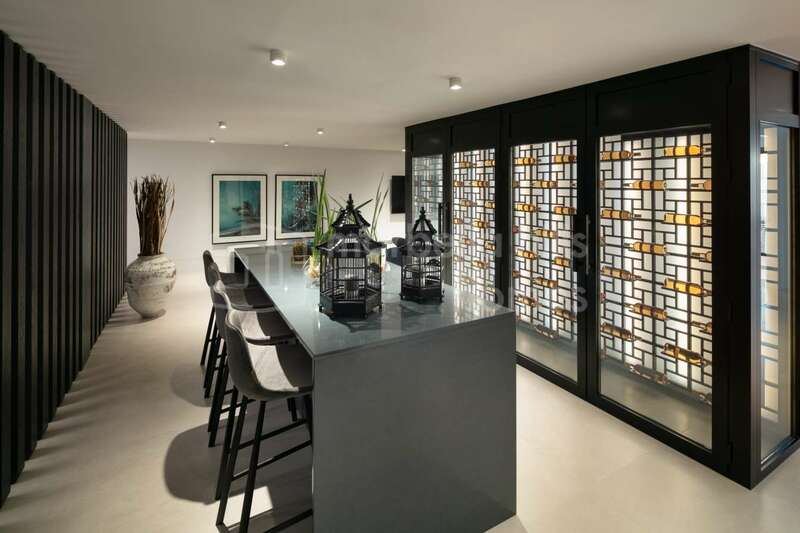 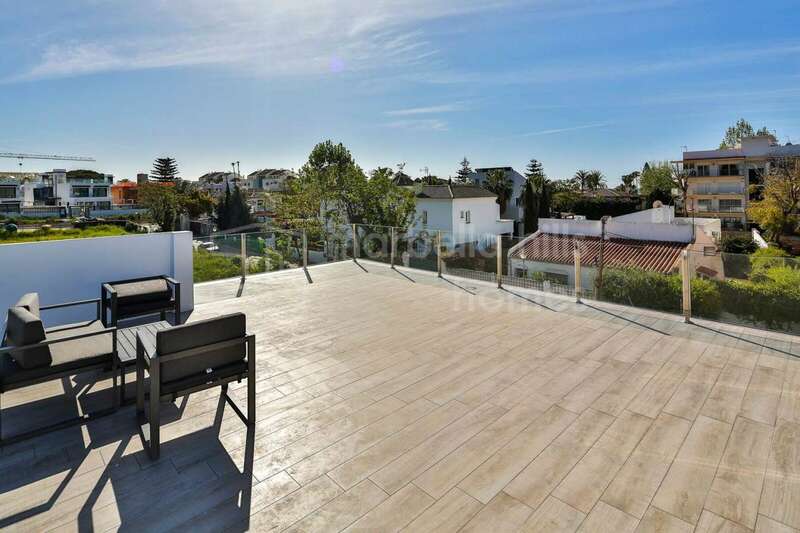 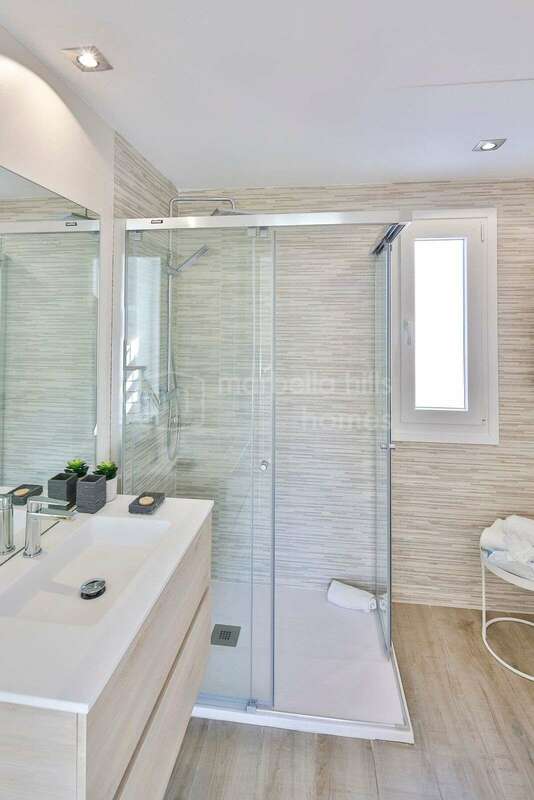 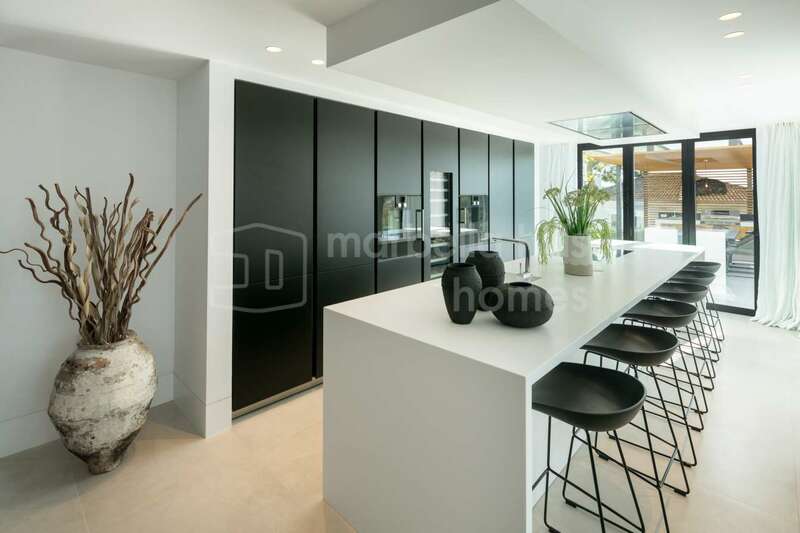 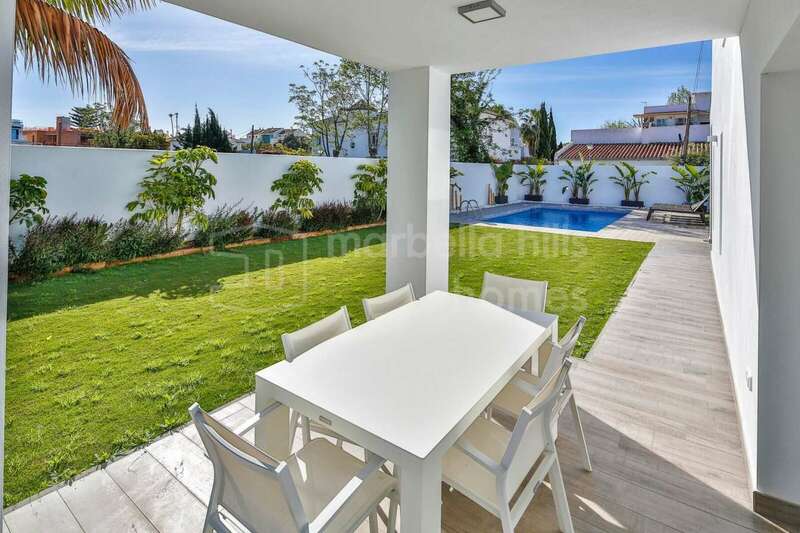 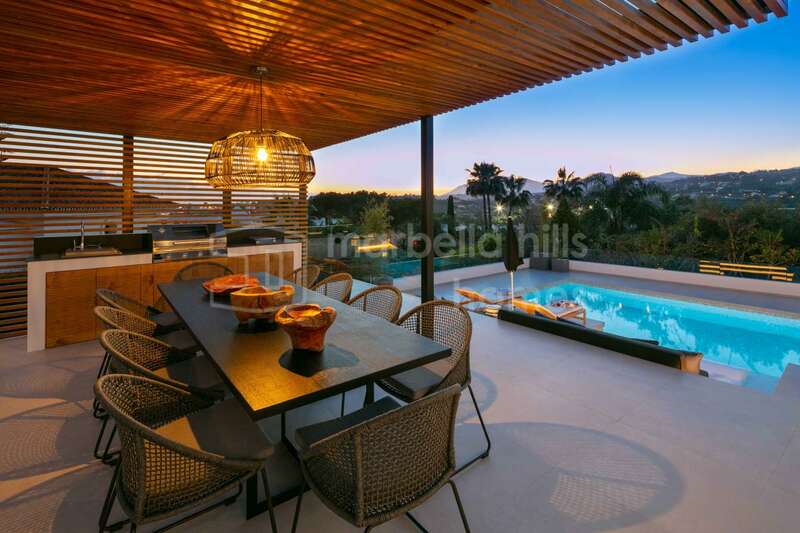 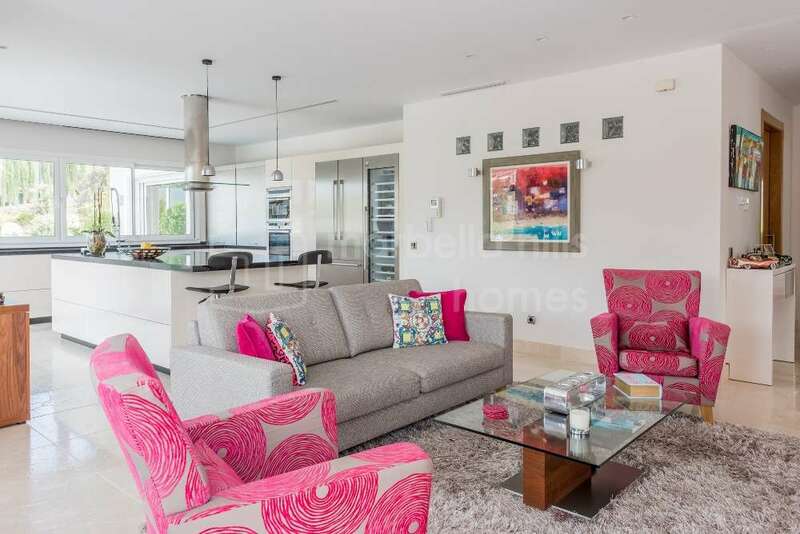 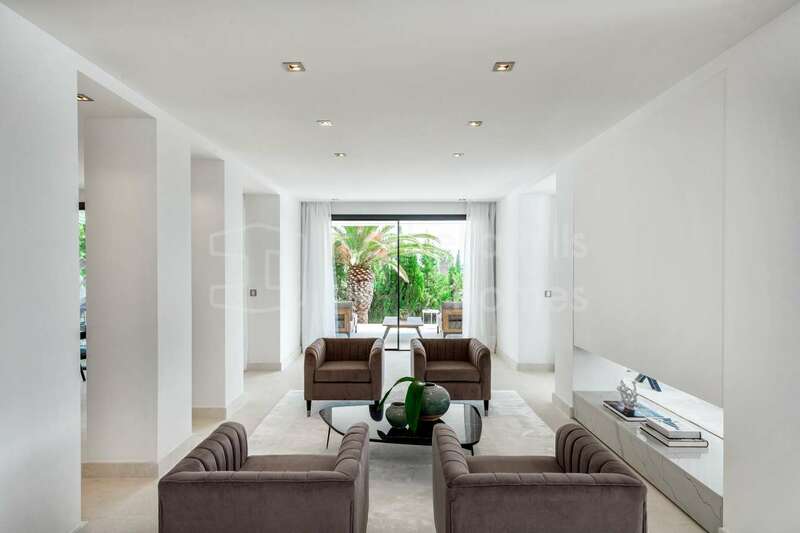 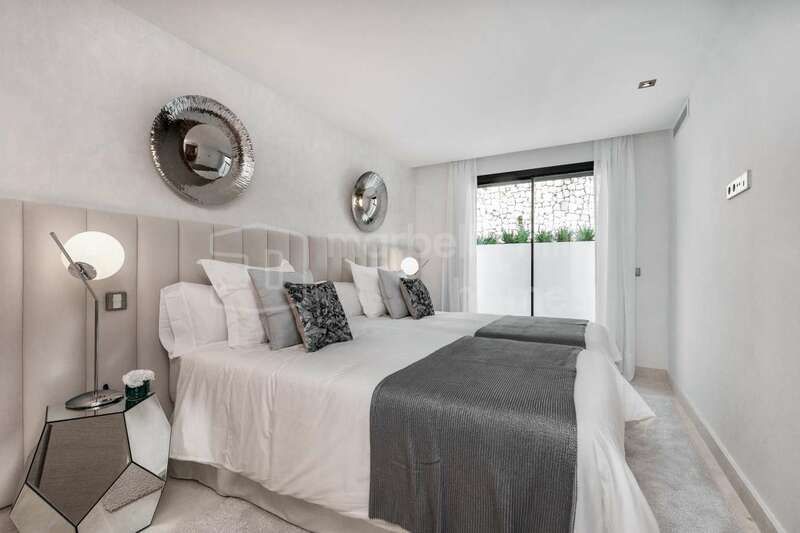 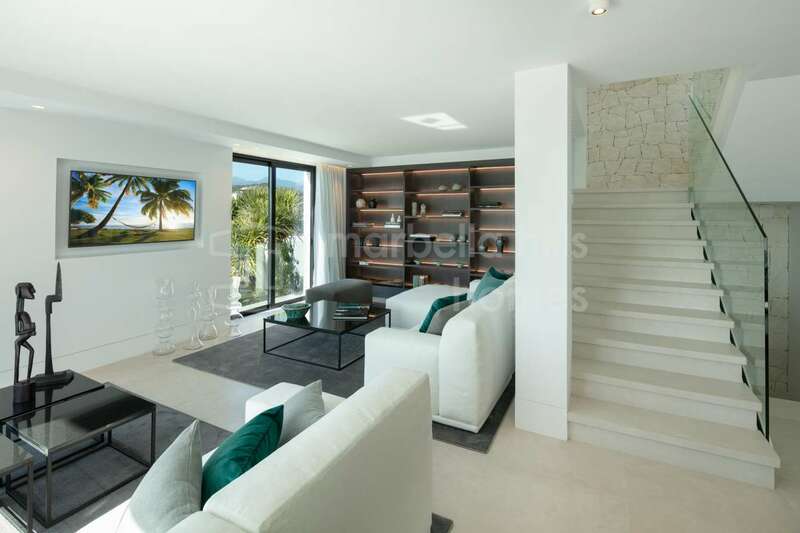 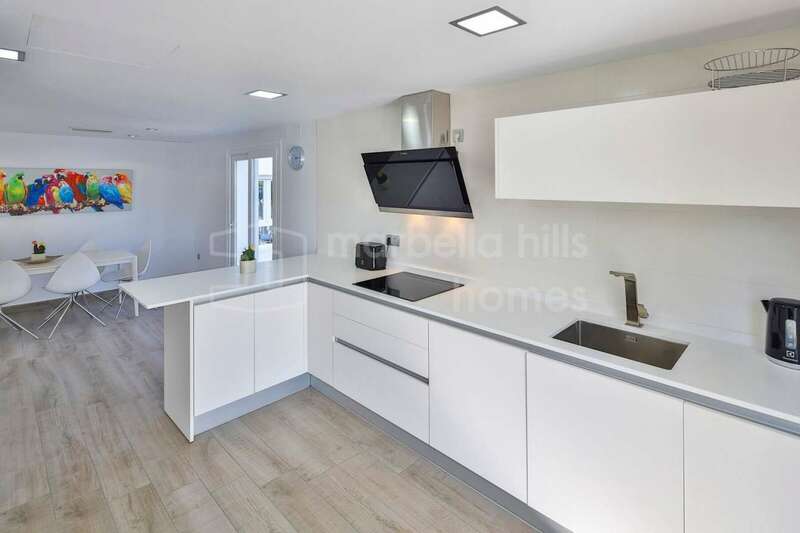 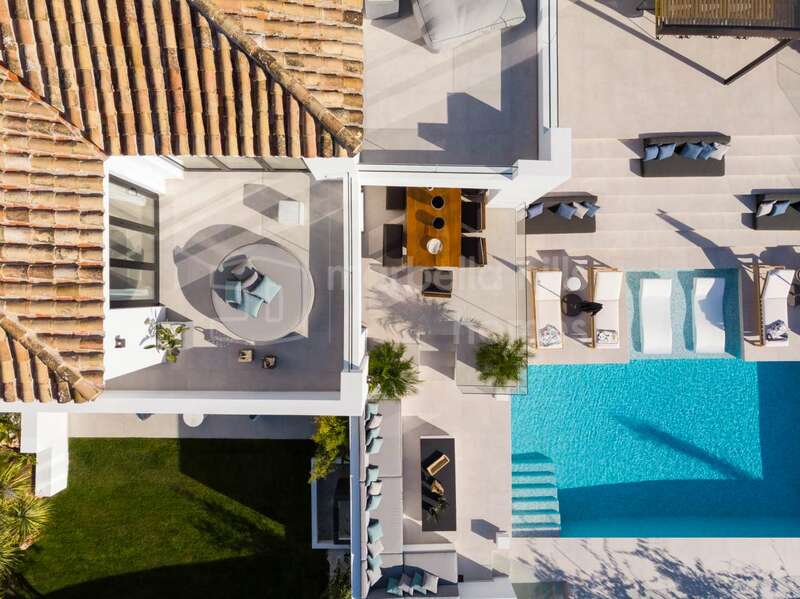 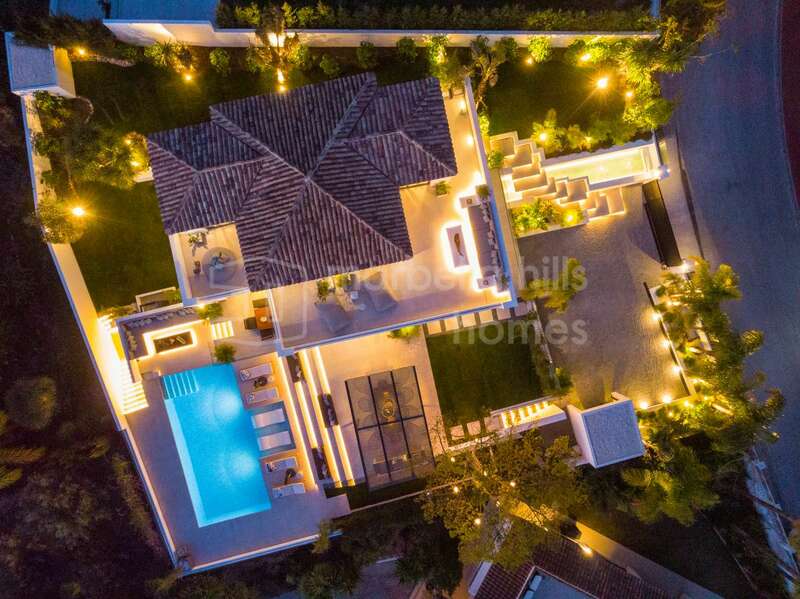 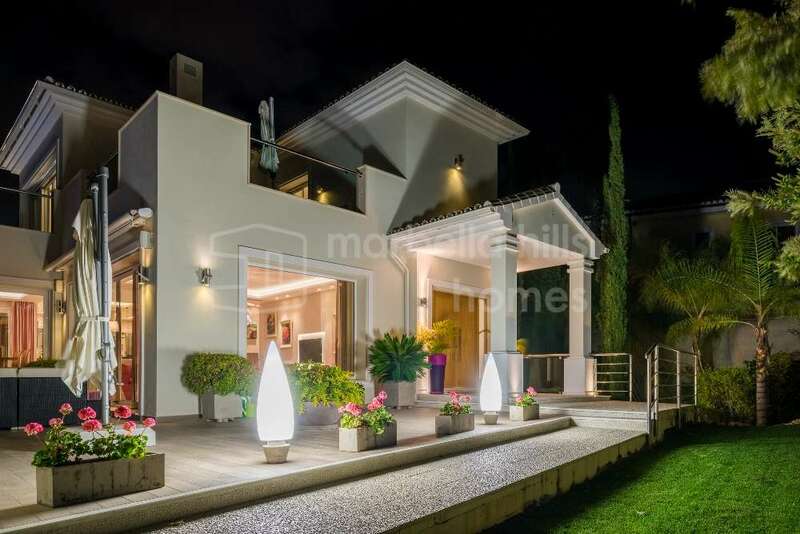 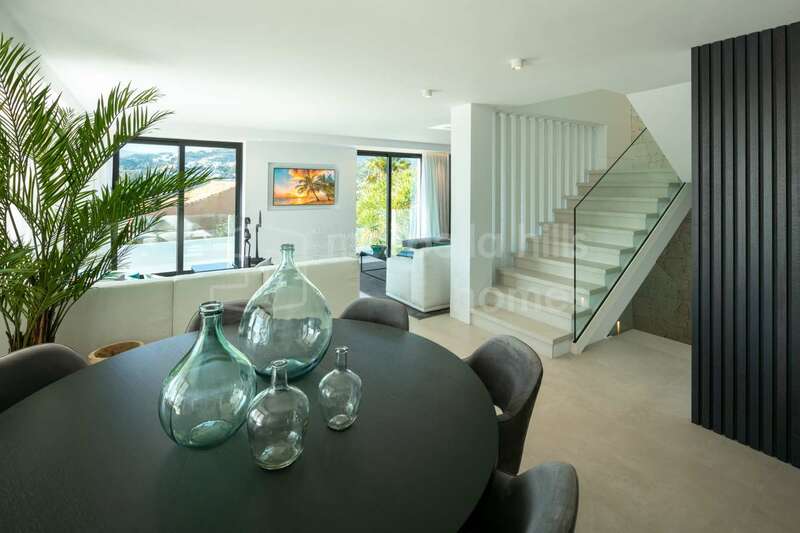 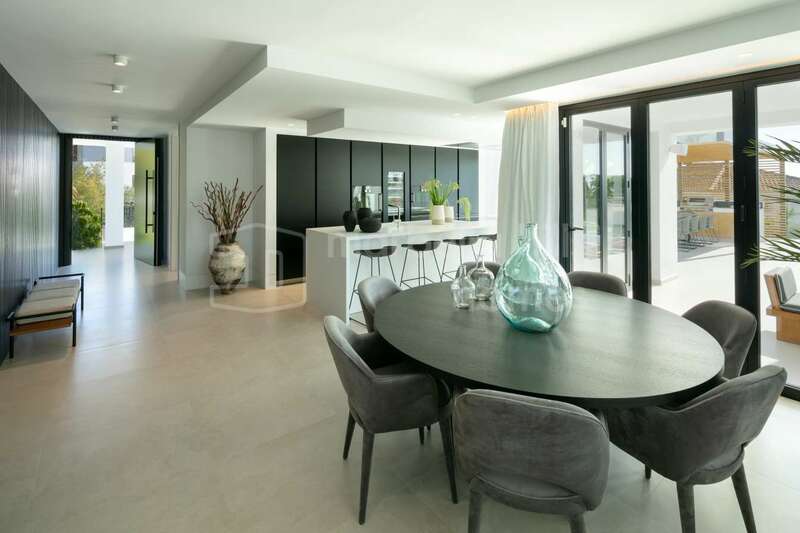 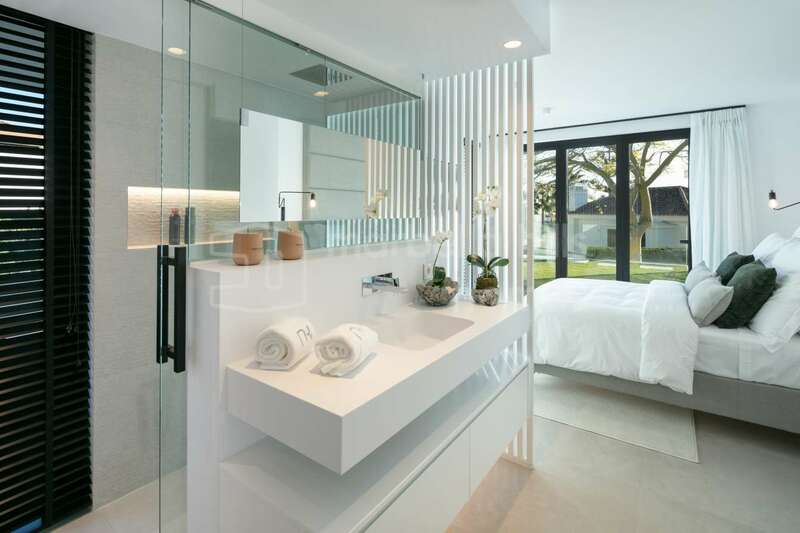 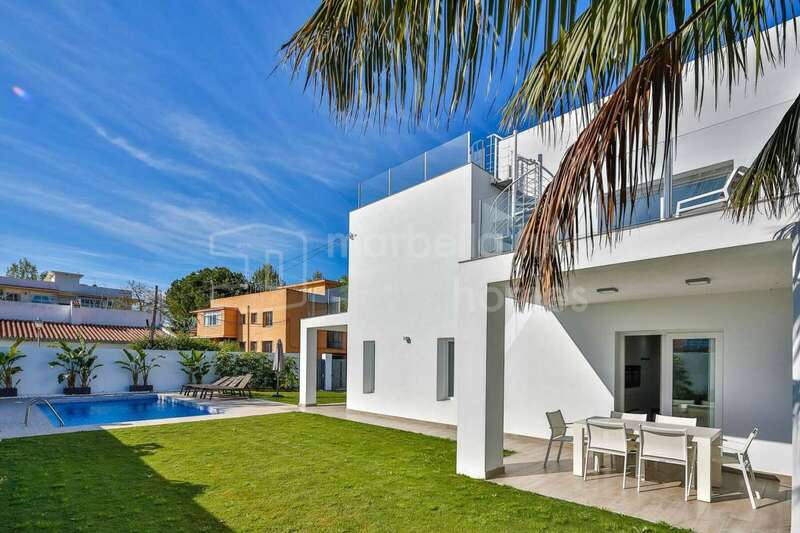 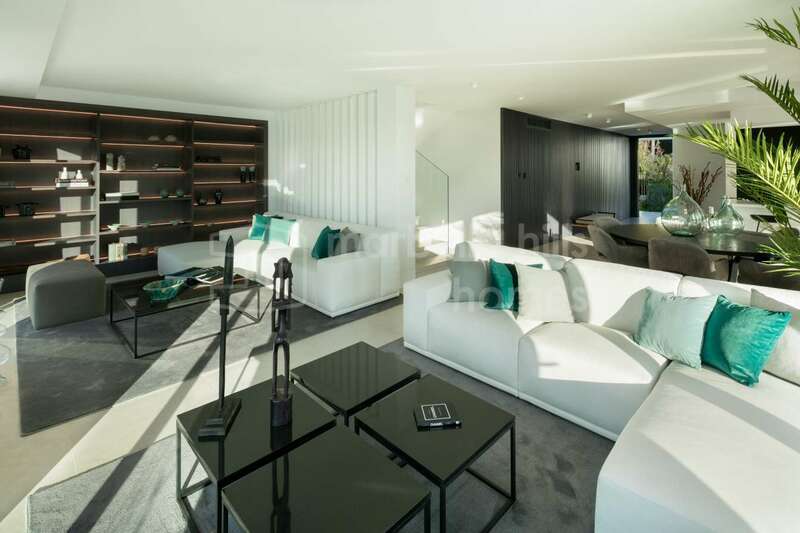 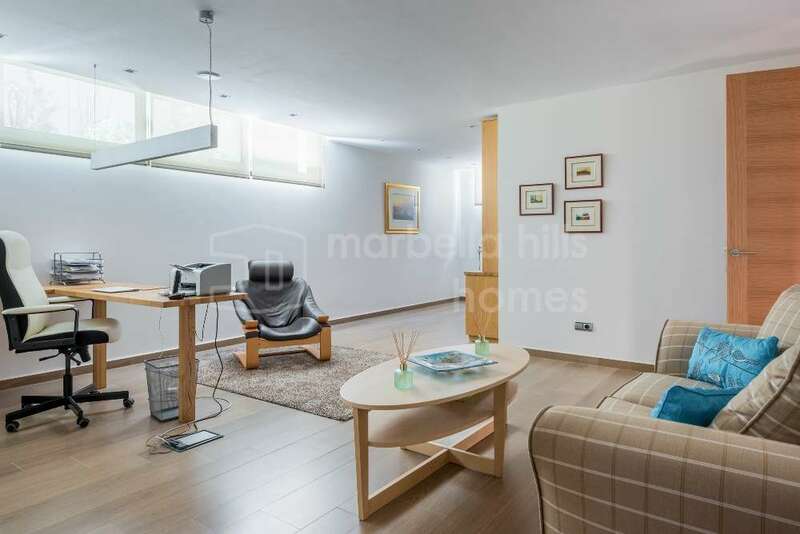 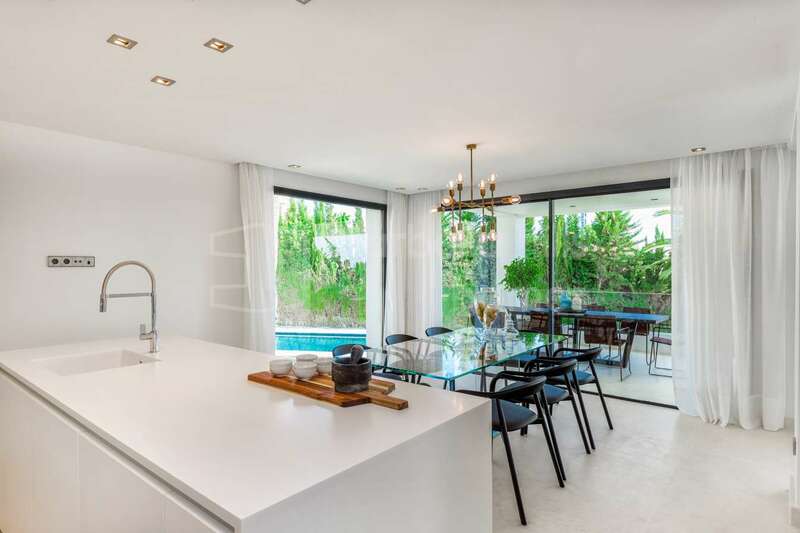 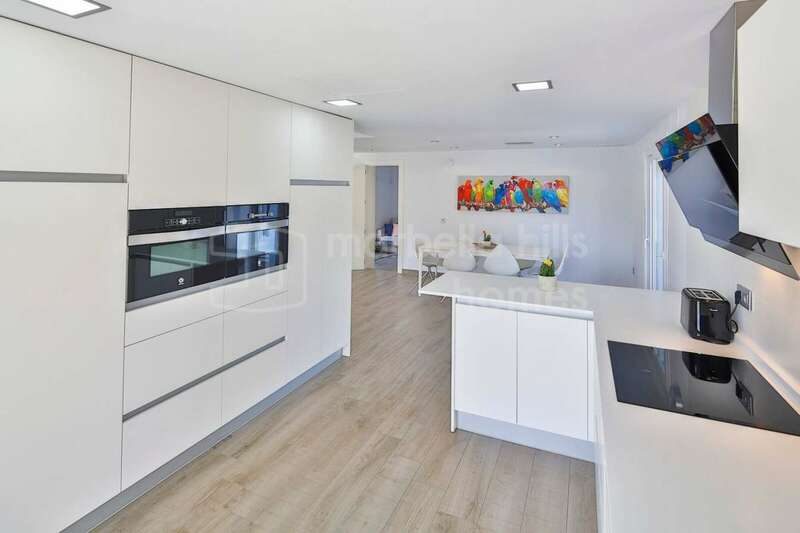 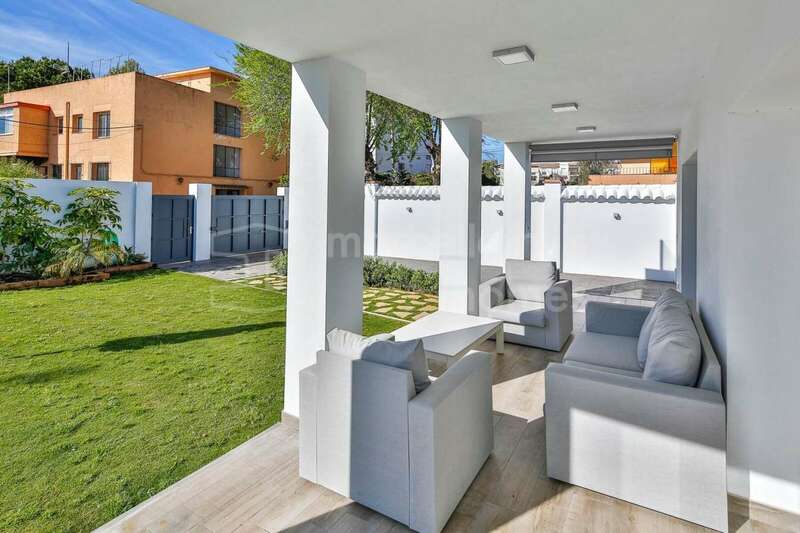 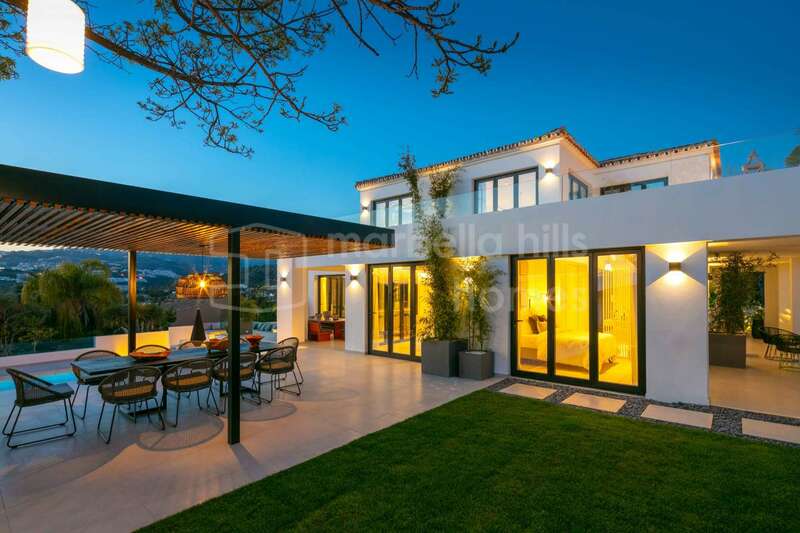 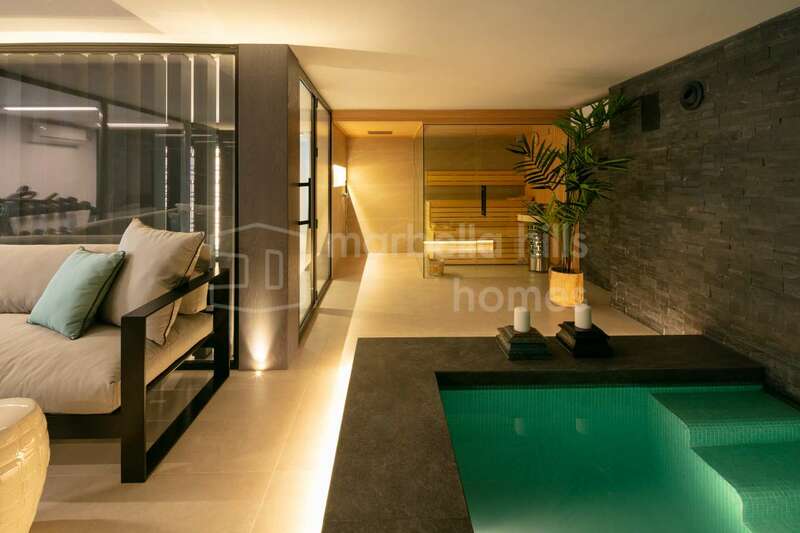 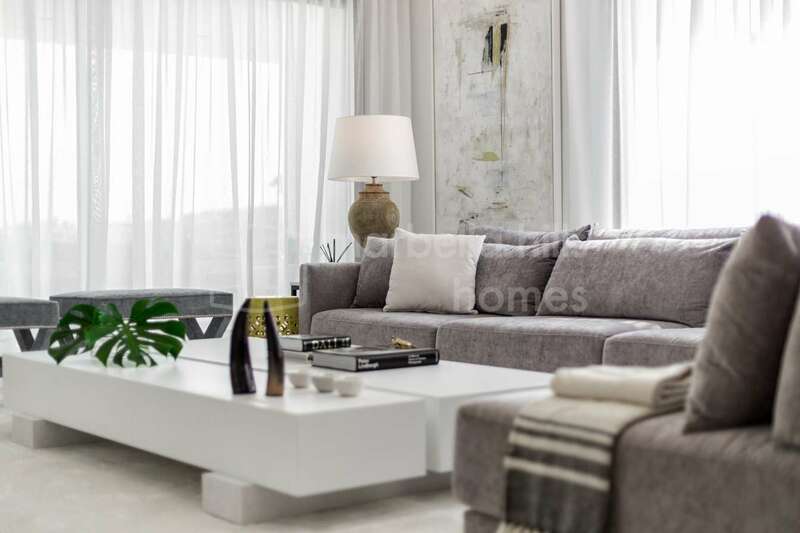 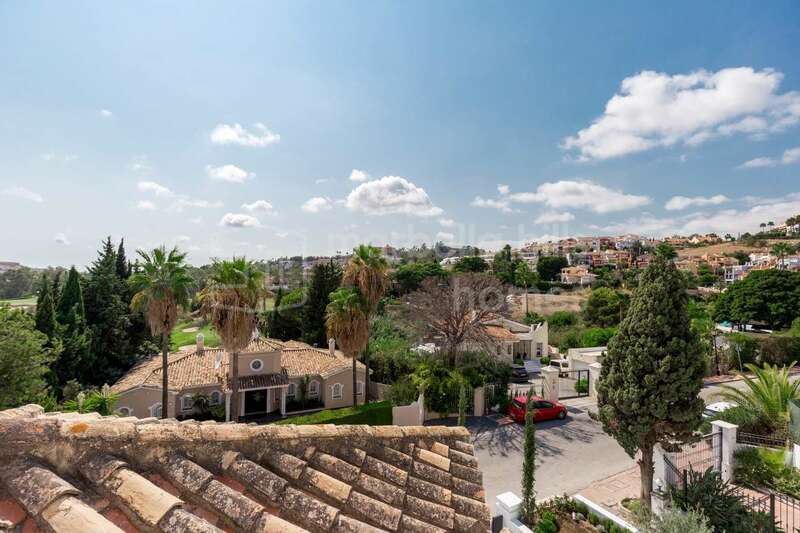 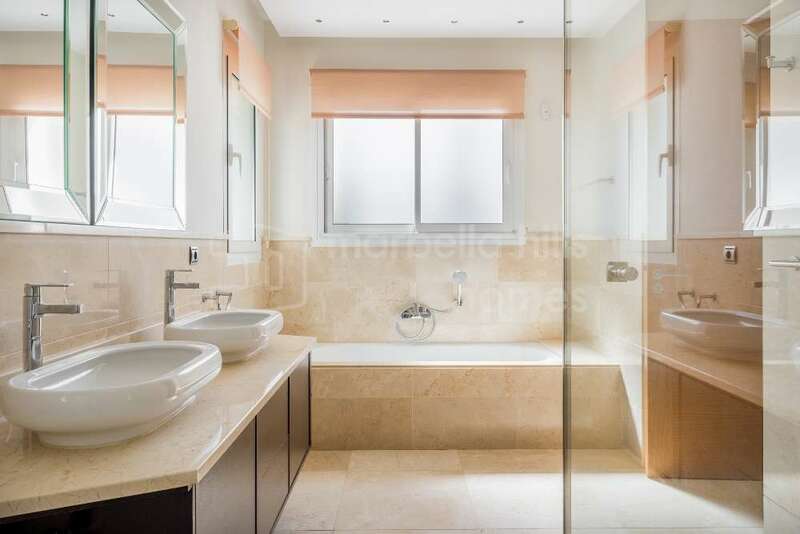 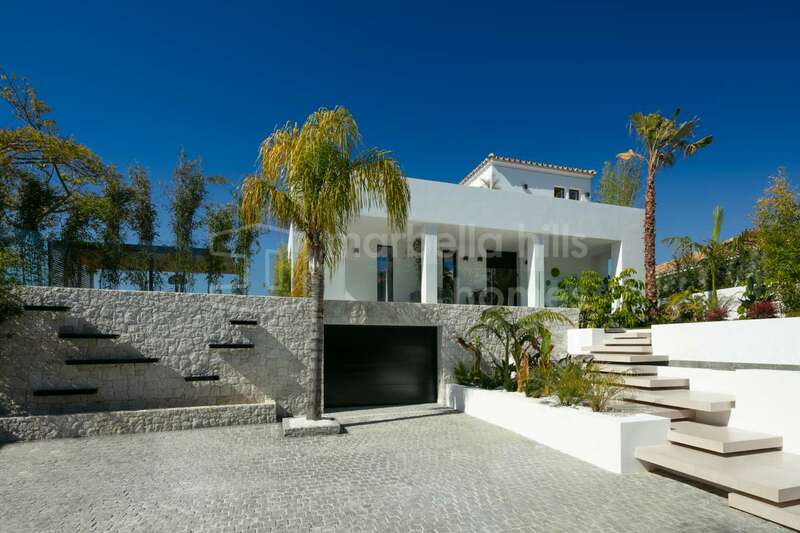 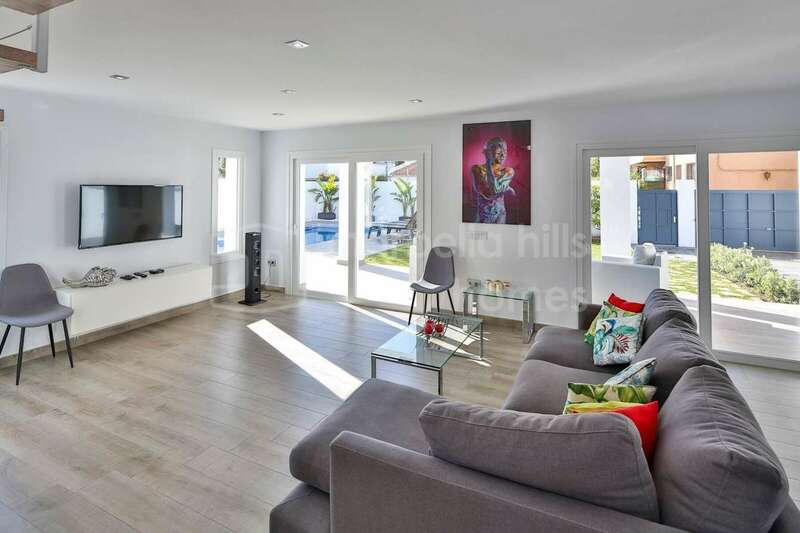 Splendid contemporary villa of 5 bedrooms and 4 bathrooms occupying a privileged position within the prestigious Los Naranjos golf course in Nueva Andalucia. 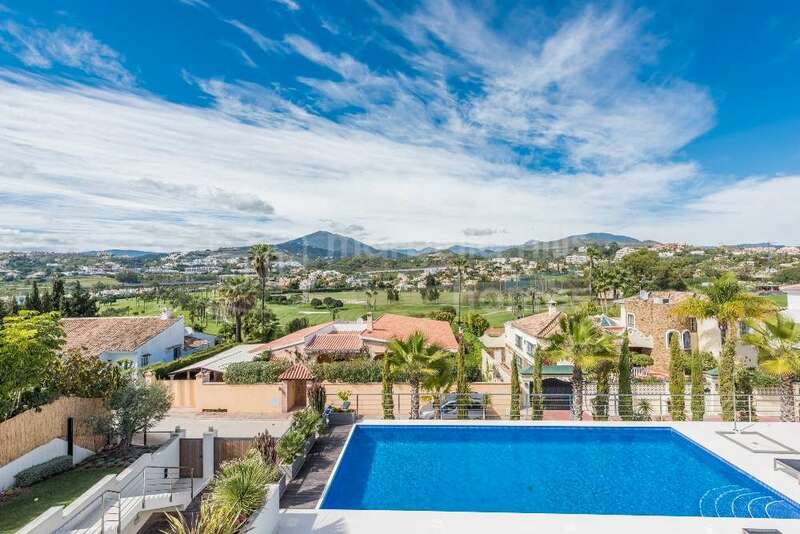 Dominant sea and mountain view. 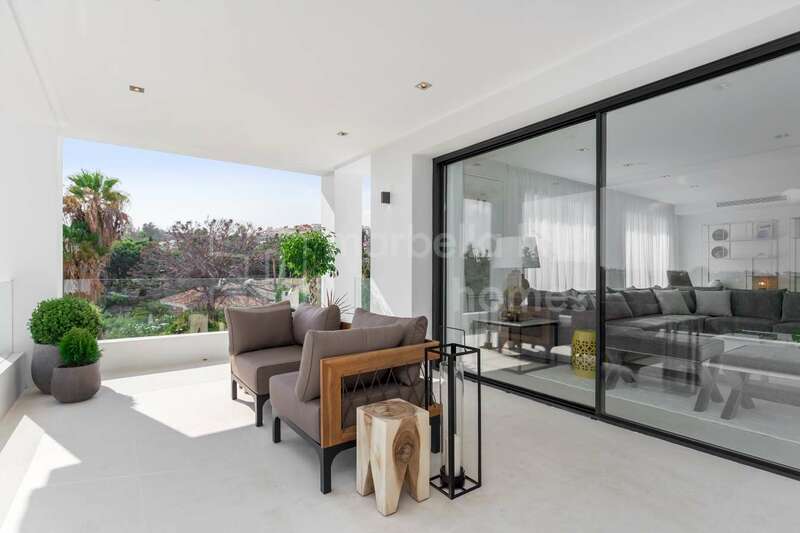 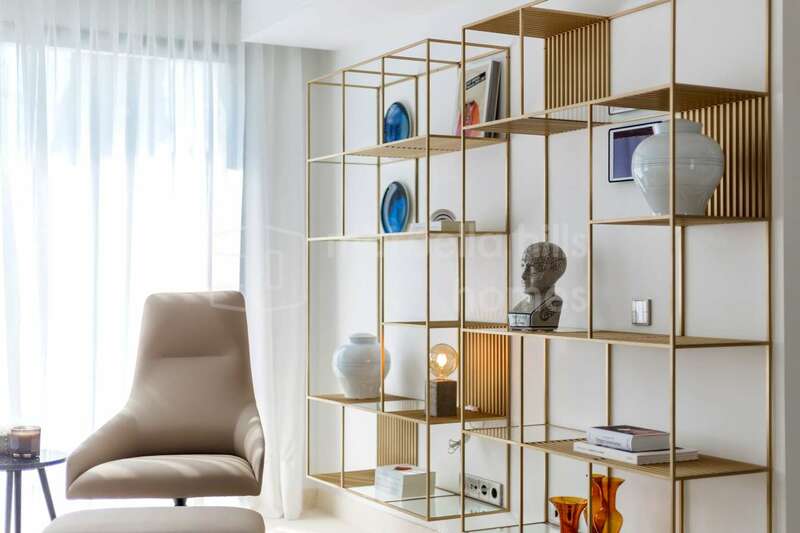 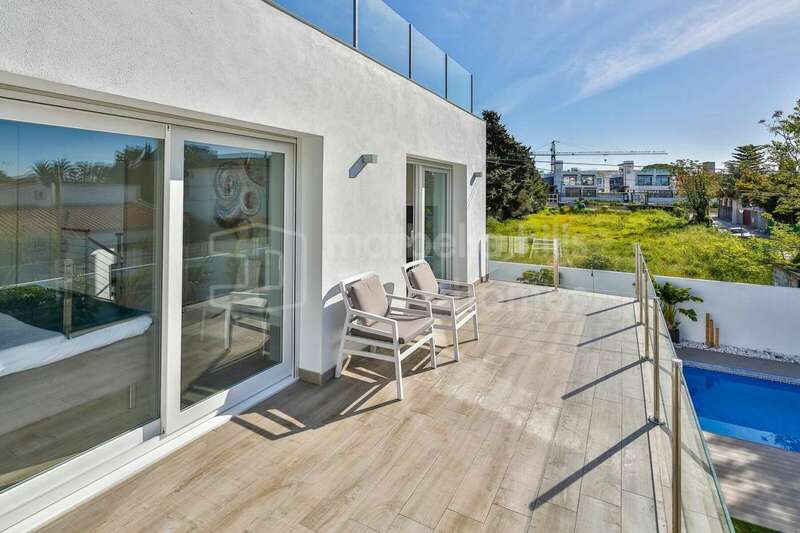 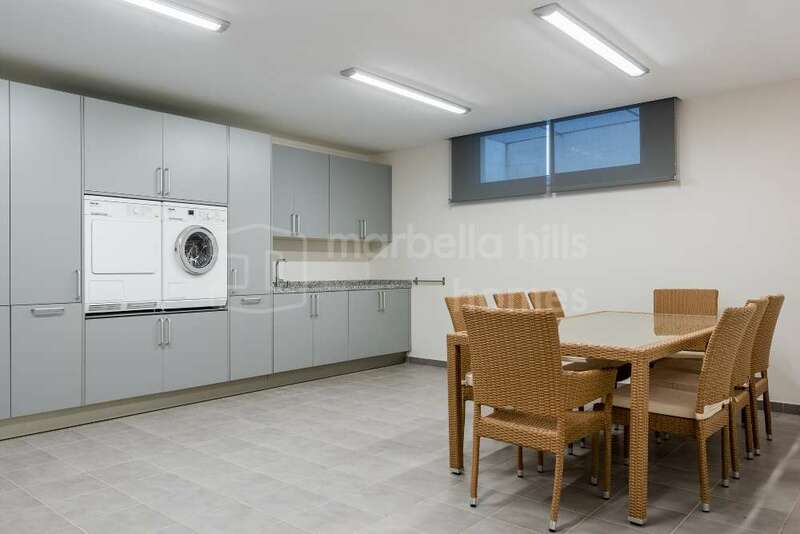 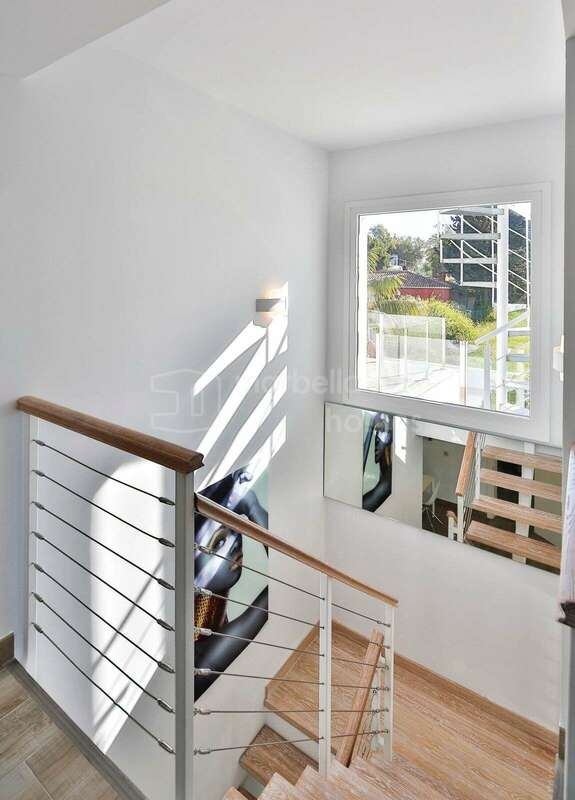 Built on three levels at the highest level of quality, the property offers a superb open living area with fireplace and high ceilings, extended by a large terrace and a gazebo to fully enjoy the Mediterranean lifestyle with a designer kitchen fully equipped. 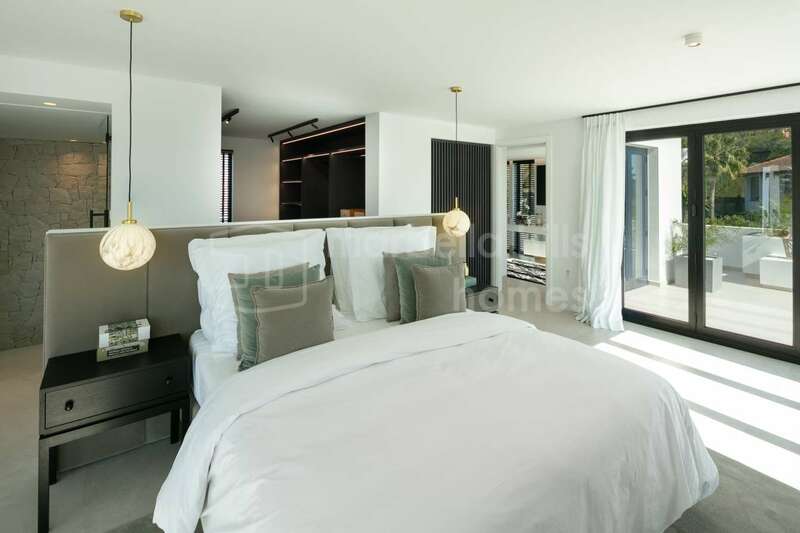 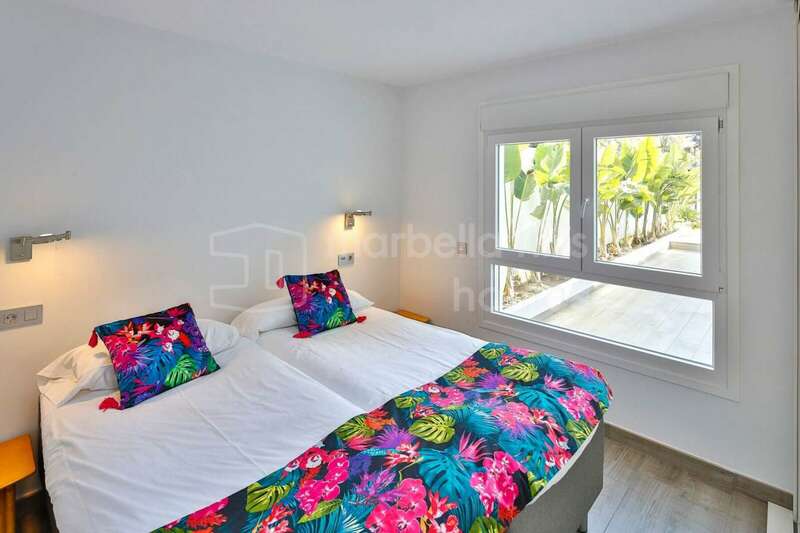 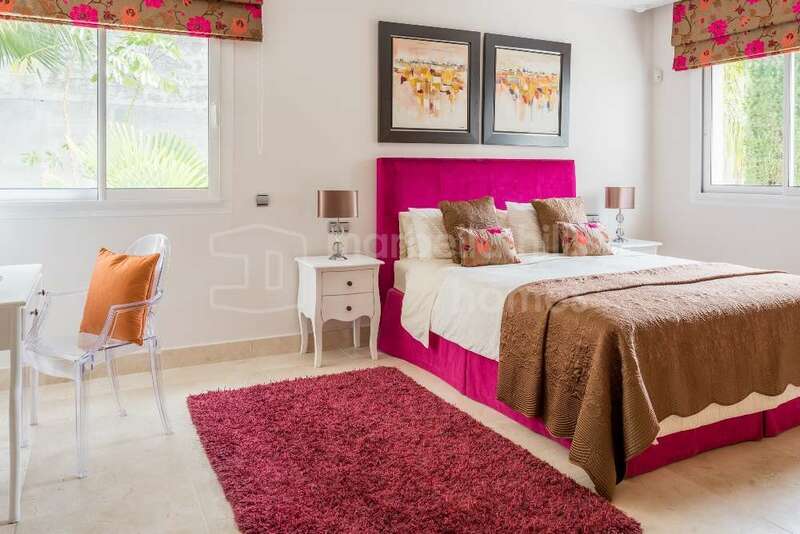 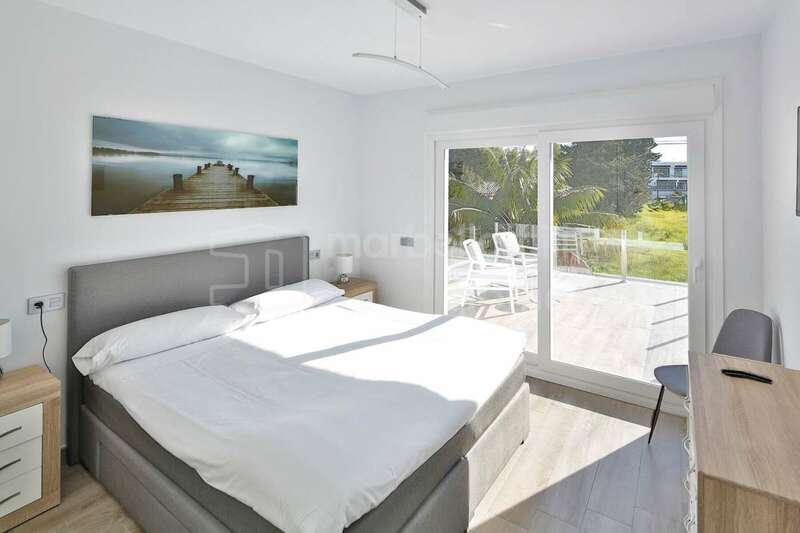 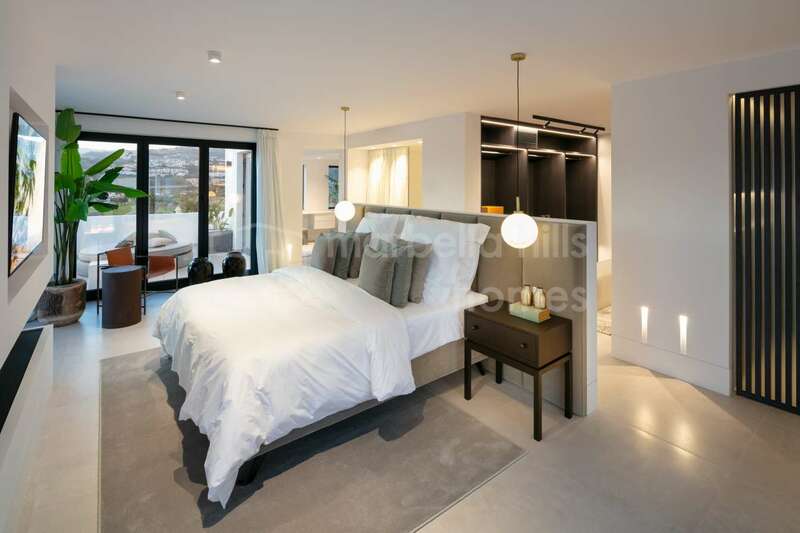 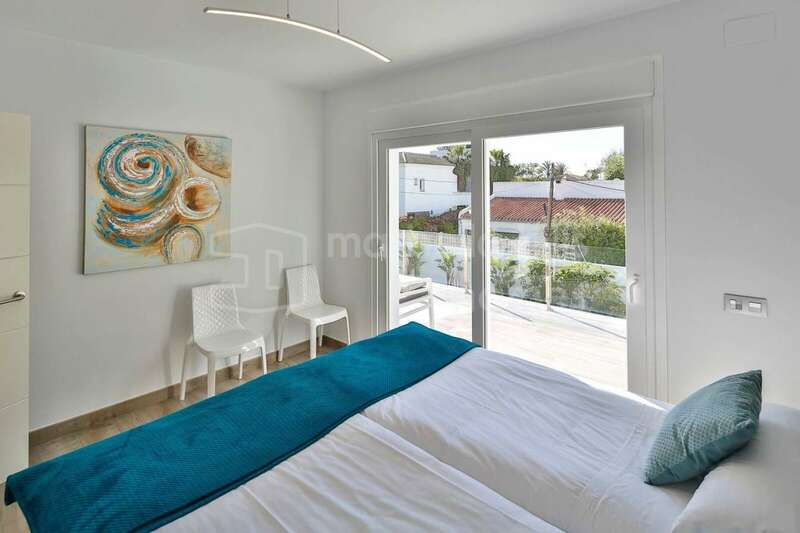 On the upper floor, a fantastic master suite with private terrace. 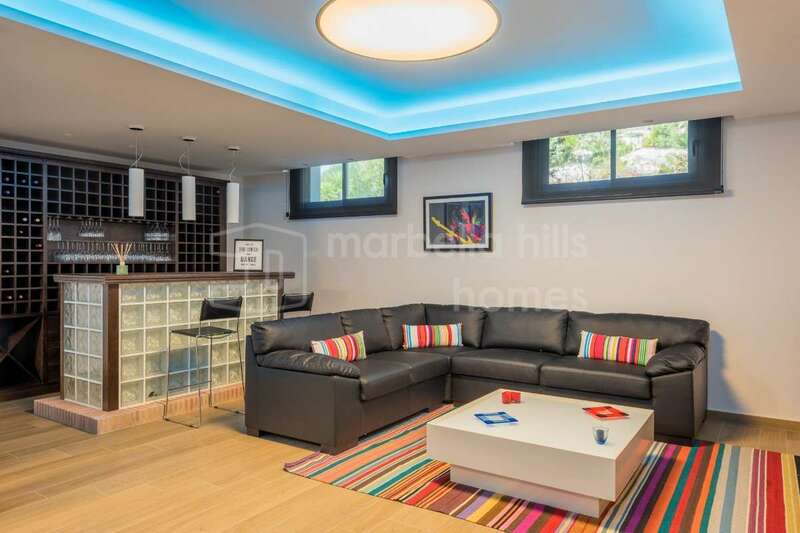 On the lower floor, 4 bedrooms, 3 bathrooms, an entertaining/play room with bar, a laundry room. 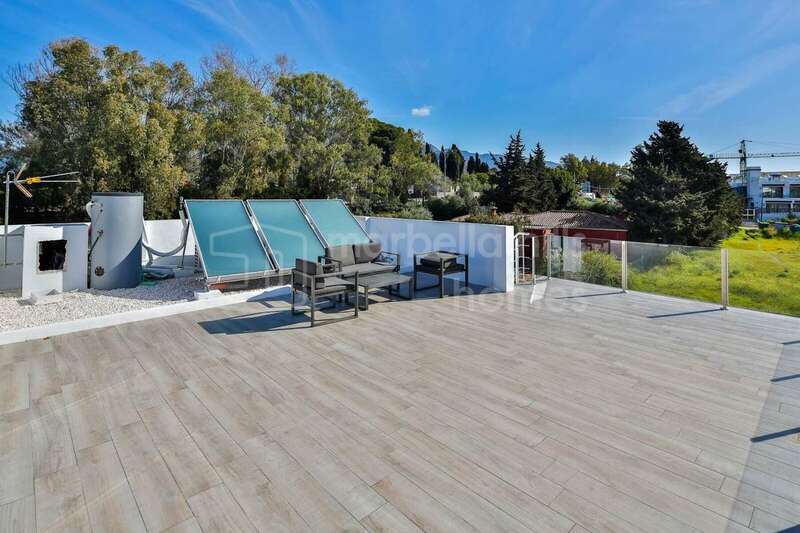 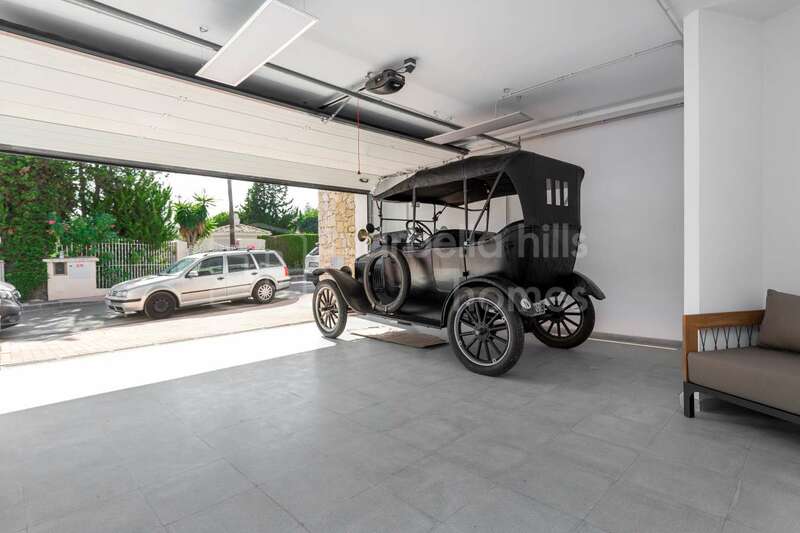 200m2 additional suitable for conversion. 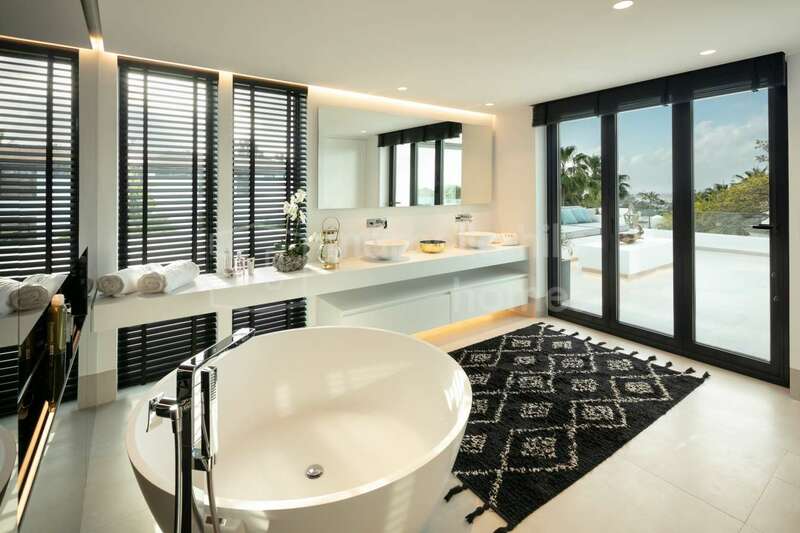 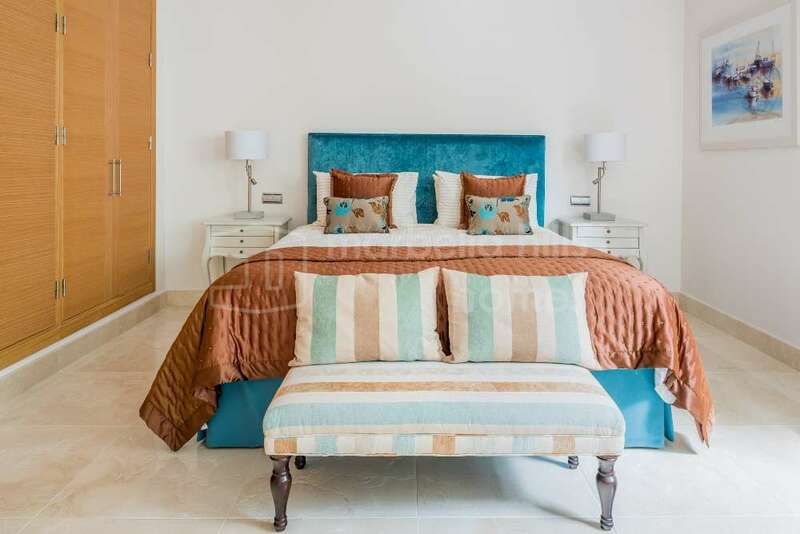 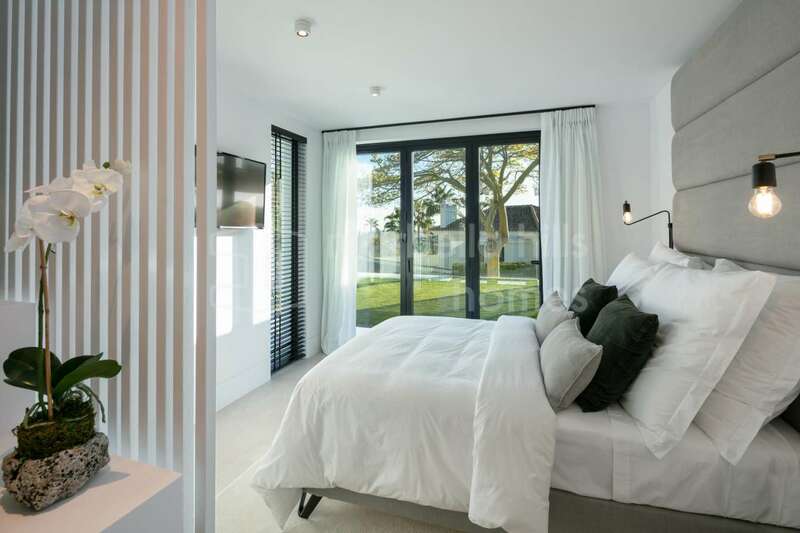 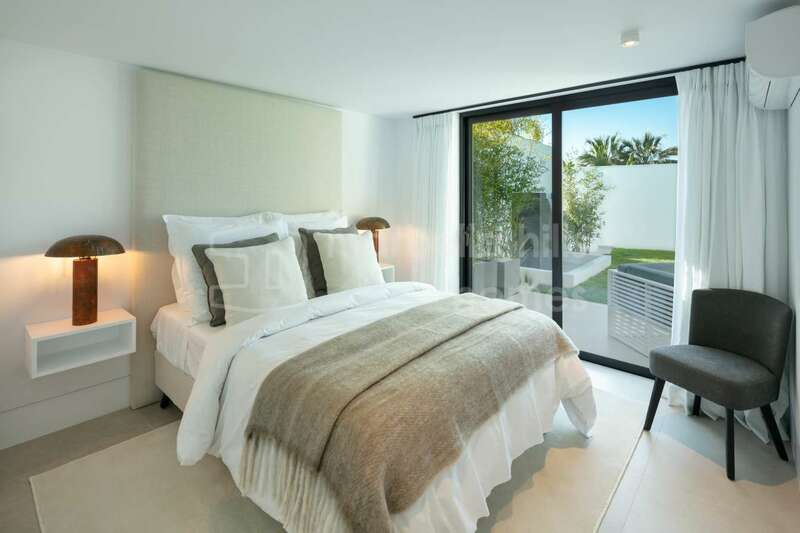 The villa also benefits from a Creston home automation system, a Linn sound system and many other high – end services. 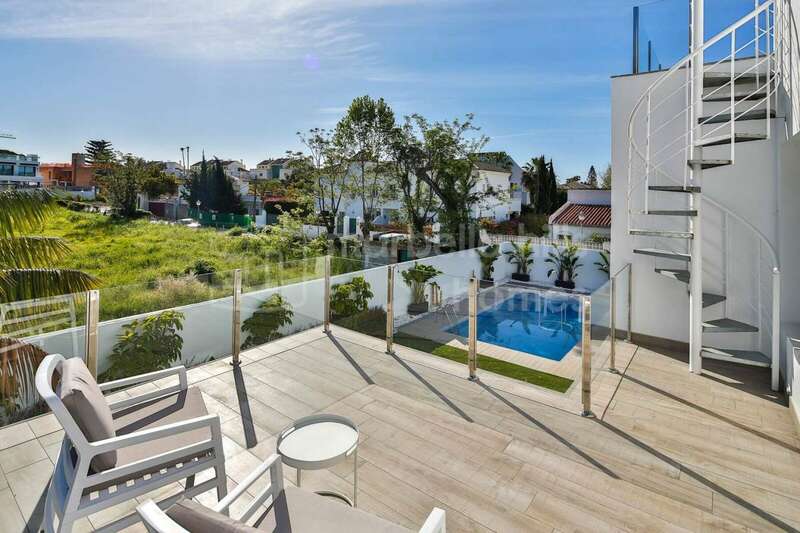 Private pool. 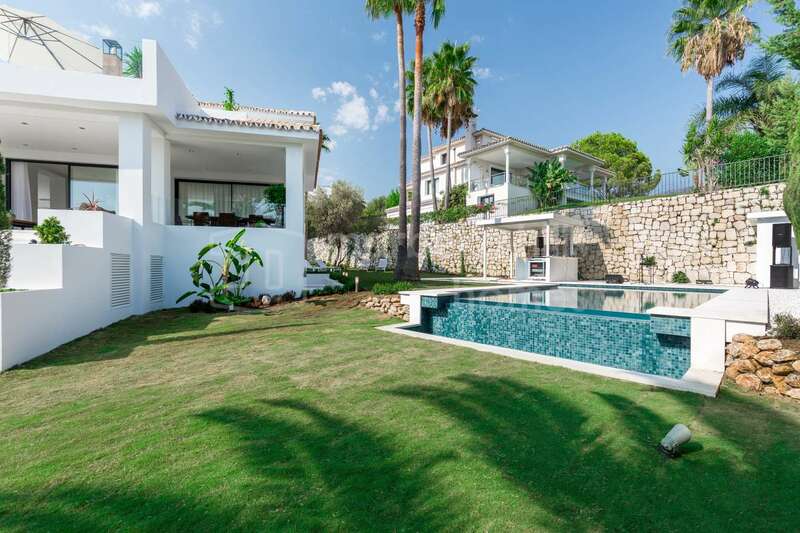 Beautiful landscaped garden. 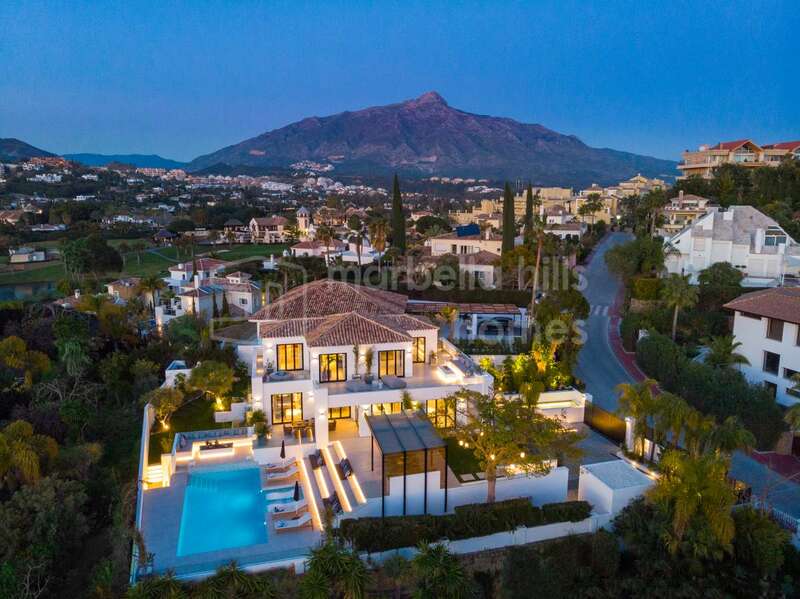 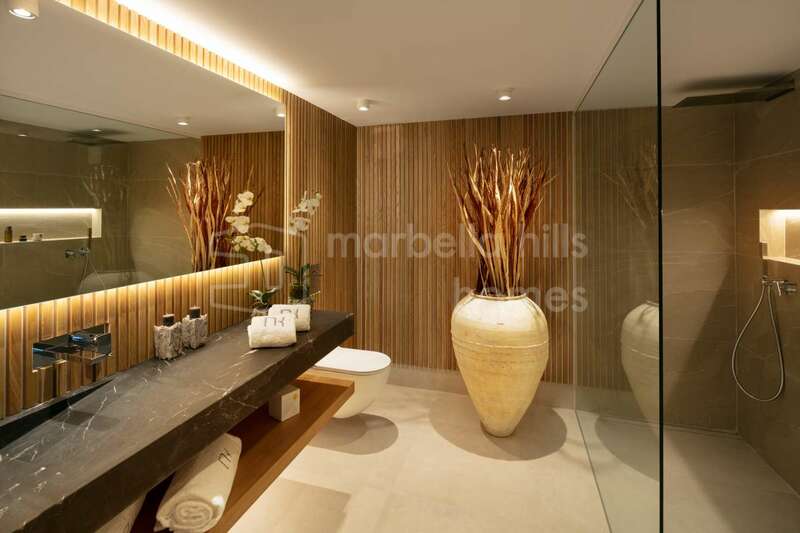 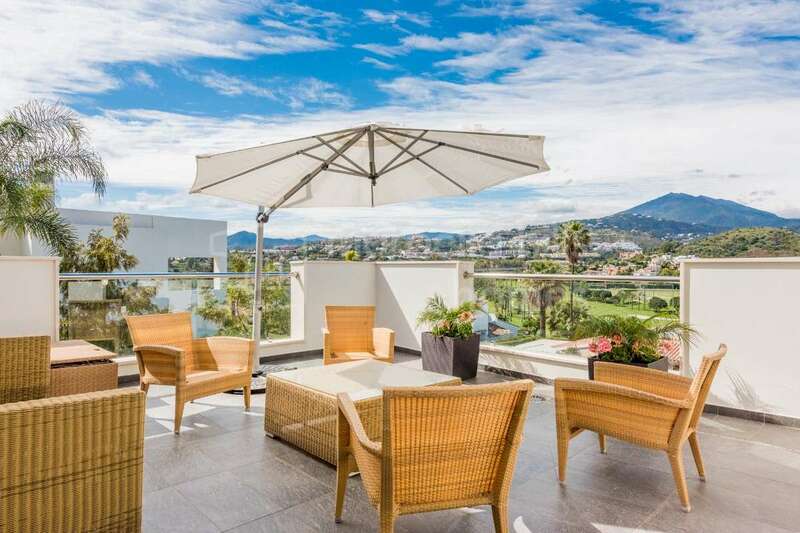 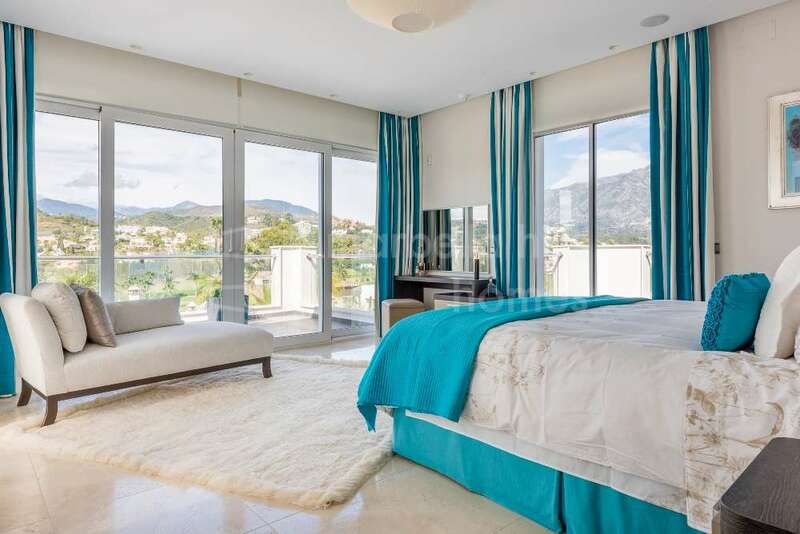 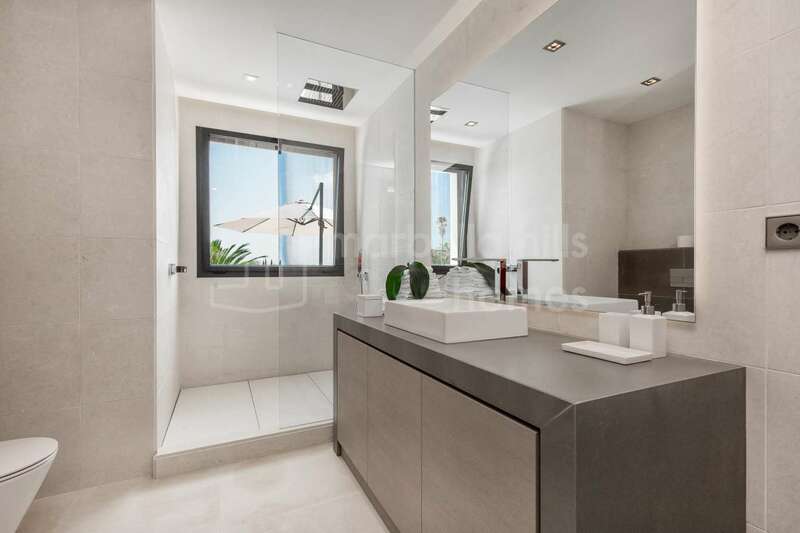 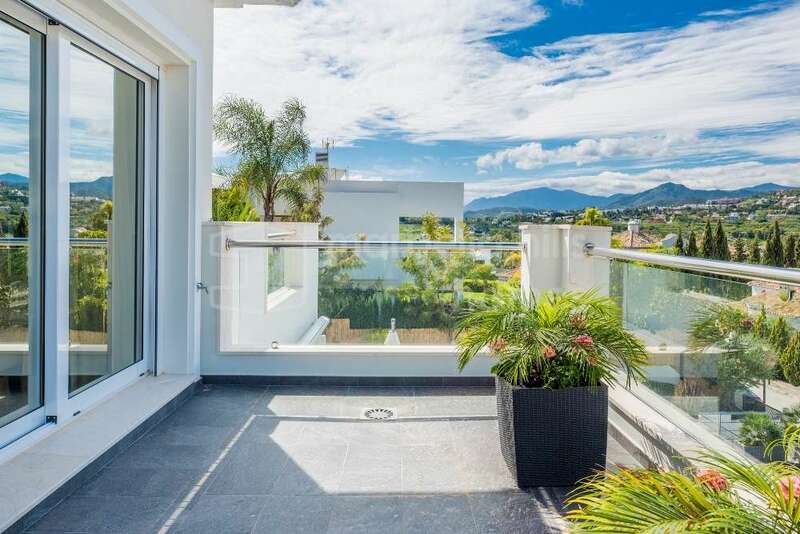 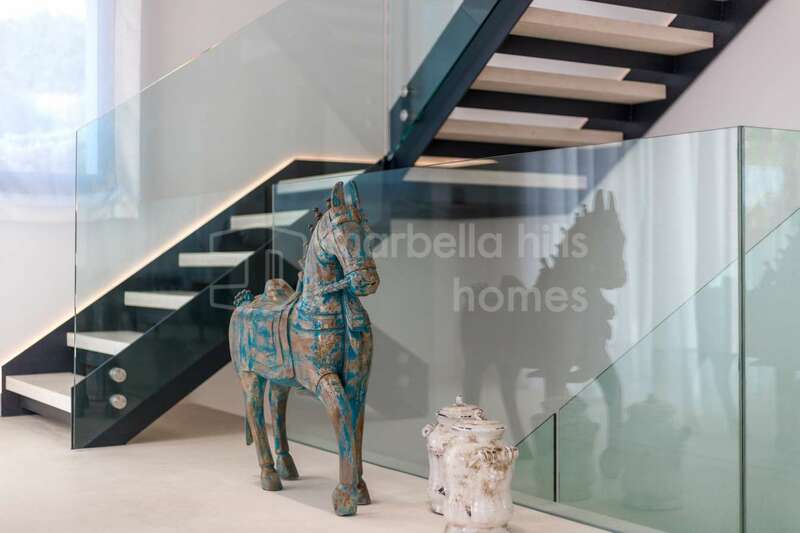 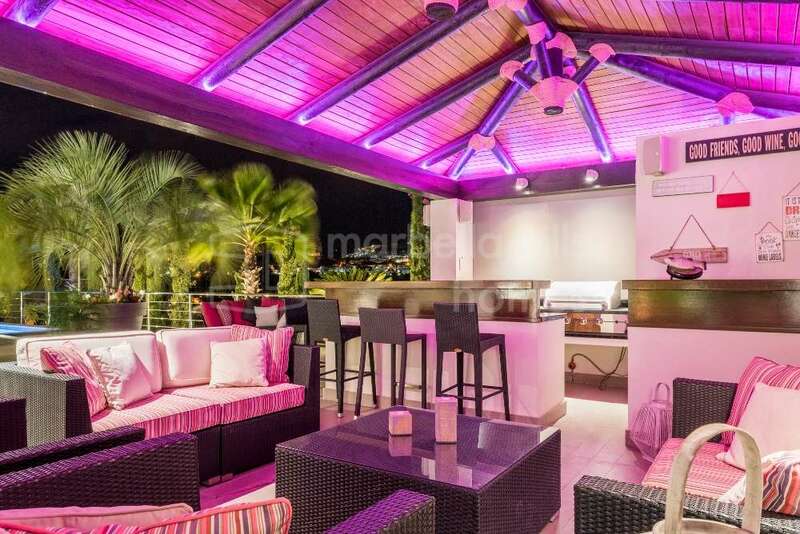 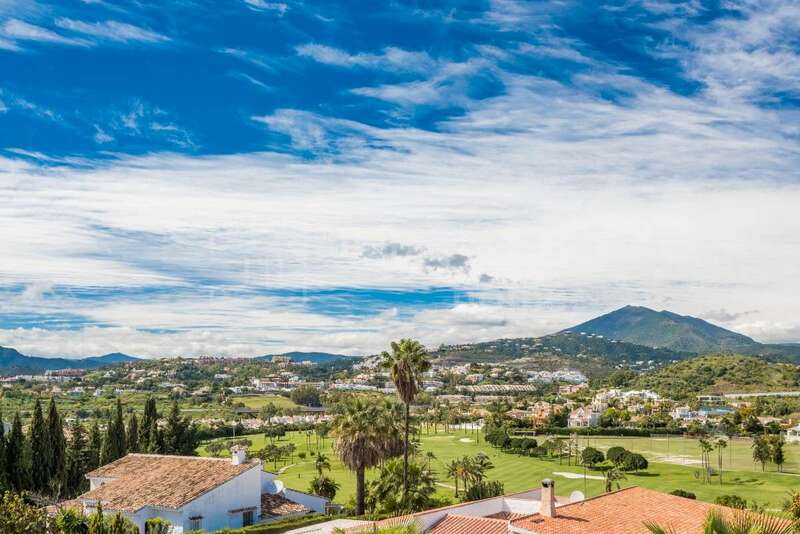 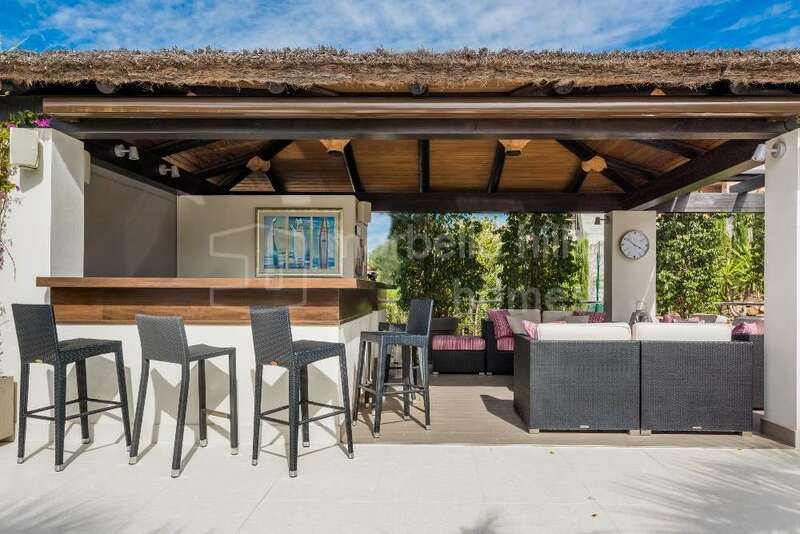 A luxurious property superbly located, just a few minutes drive from Puerto Banùs and the center of Marbella. 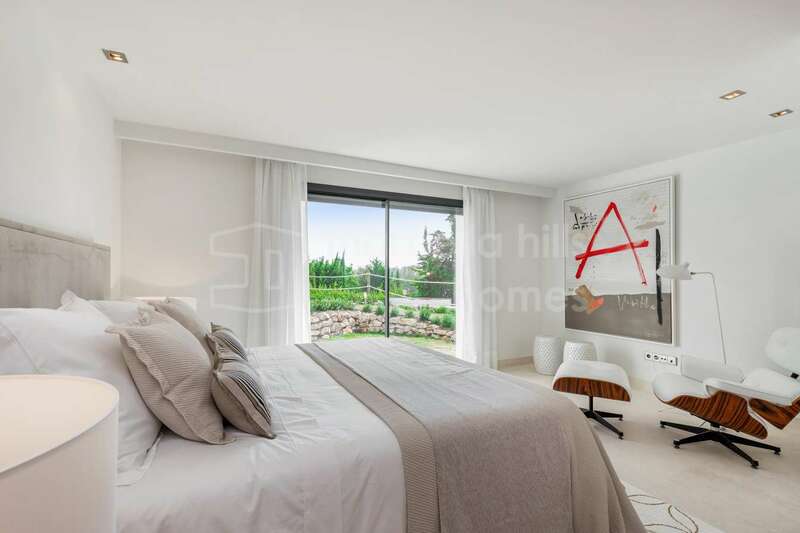 Front line golf, Fully fitted kitchen, Close to shops, Close to schools, Office room, Fireplace, Marble floors, Satellite TV, Basement, Guest room, Storage room, Alarm, Double glazing, Dining room, Barbeque, Security service 24h, Guest toilet, Living room, Amenities near, Mountain view, Golf view, Underfloor heating (throughout), Laundry room, Internet - Wifi, Electric blinds, Fitted wardrobes, Gated community, Air conditioning, Garden view, Panoramic view, Cinema room, Unfurnished, Close to children playground, Close to Golf, Game Room, Open plan kitchen, Optional furniture, Excellent condition.